So let’s ALL follow Jack’s wise advice and make a resolution to have NO BAD DAYS in 2017! THINK POSITIVE and make the best of even the worst situation! Along with resolutions, many of you are starting to make your travel plans for 2017. I’m also planning ….Our annual Team Senkarik Collector Event in Santa Fe this year on September 2. I hope you can come! I’d love to personally give you a hug and thank you for being here for me. May your walls know joy, every room hold laughter, each door open to opportunity and may the Peace of Our Lord fill your life in the New Year! 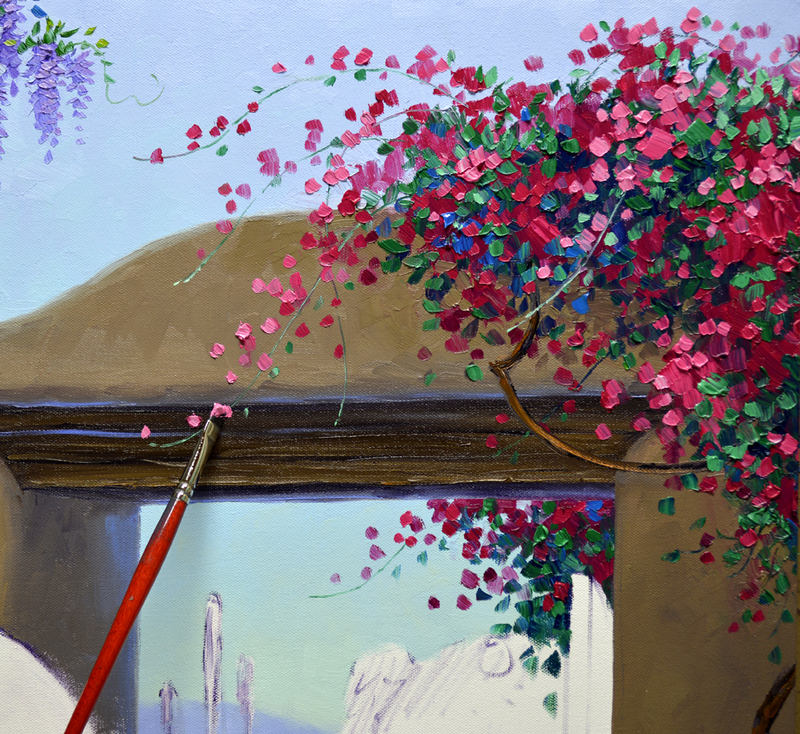 The Pink flowers of the Bougainvillea are blocked in first with several shades of Permanent Rose + White. Then I come back and paint the foliage around the masses of pink. You can see in the picture above how the painted image extends on to the side of the gallery wrap canvas. 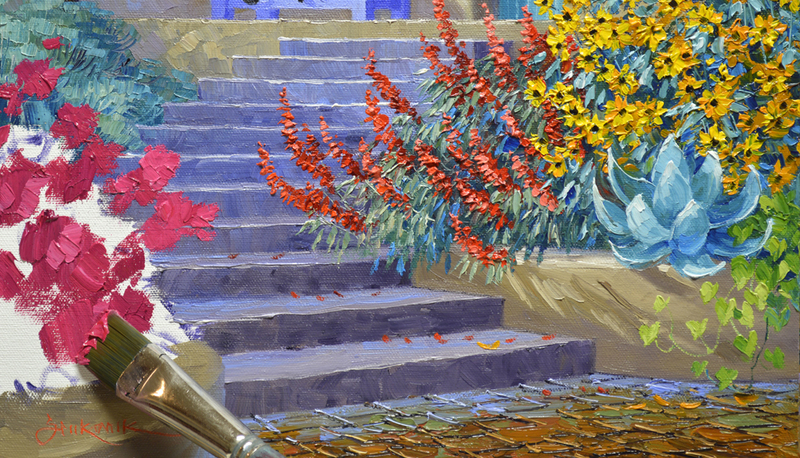 The flowers illuminated by sunshine are highlighted using a small Bright (square) brush. Want to know more about the brushes I use? CLICK HERE! Red from the Chili Ristra reflects on to the wall next to it. So a little Alizarin Crimson is added into the shadow cast by the peppers. VIDEO! OK, let’s get to that Chili Ristra, the string of peppers commonly seen throughout the American Southwest. 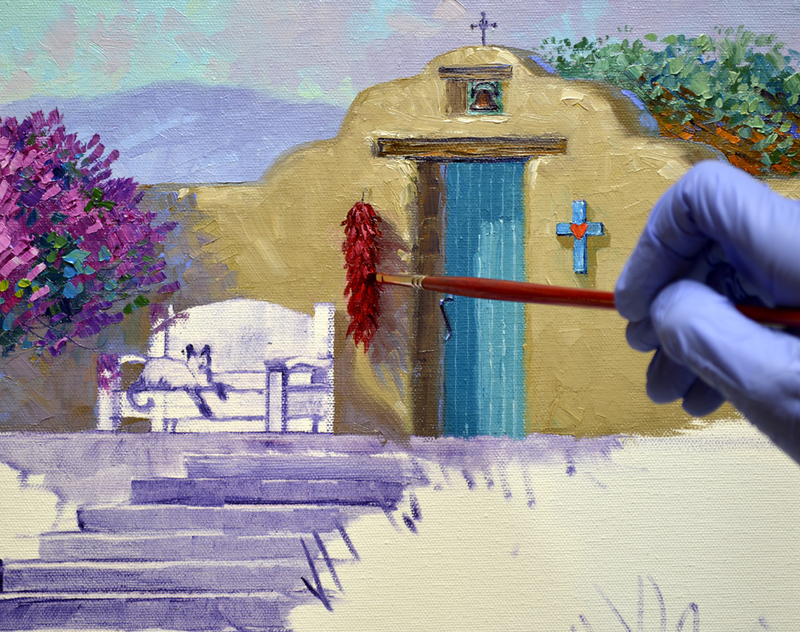 The Chili ristra was initially washed in with a mixture of Alizarin Crimson + Liquin. 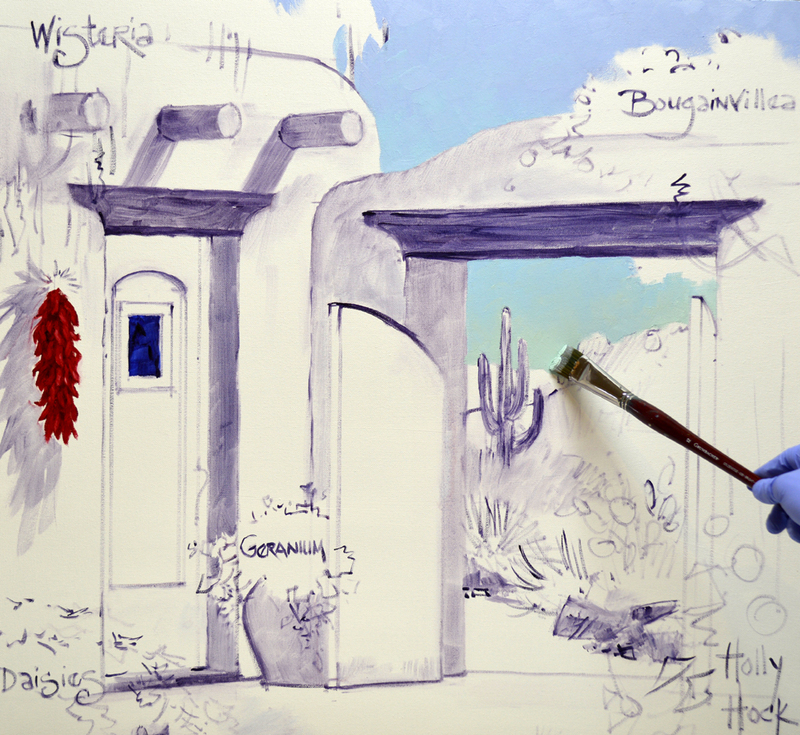 Now that the wash in is dry I’m coming back and finishing the ristra. 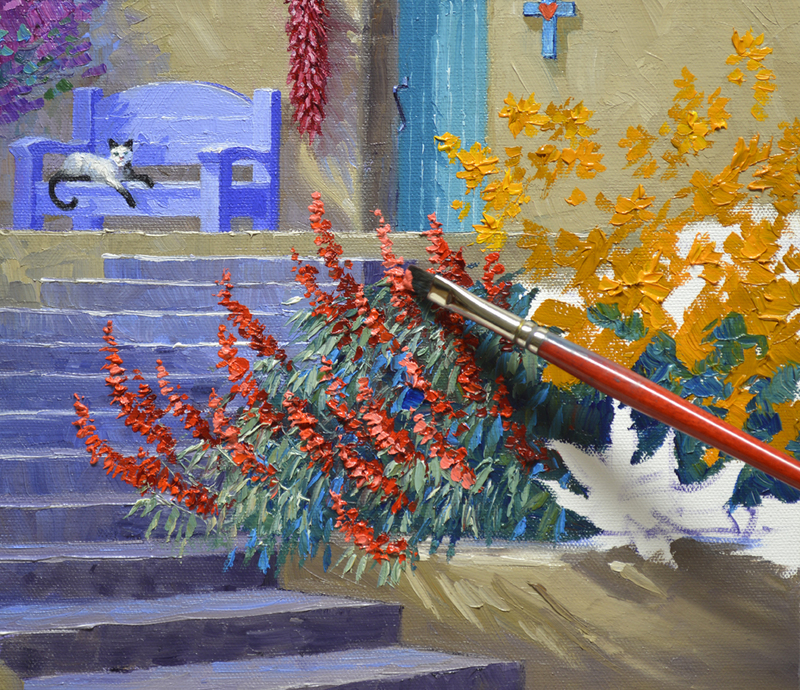 The oil paint is applied with lots of texture, using a brush to “sculpt” the individual peppers. Now we’ll go back to the distant bluffs. Several variations of MUD (Ultramarine Blue + Alizarin Crimson) + Cadmium Red Light + Cadmium Orange + White are combined for the Red Rocks. 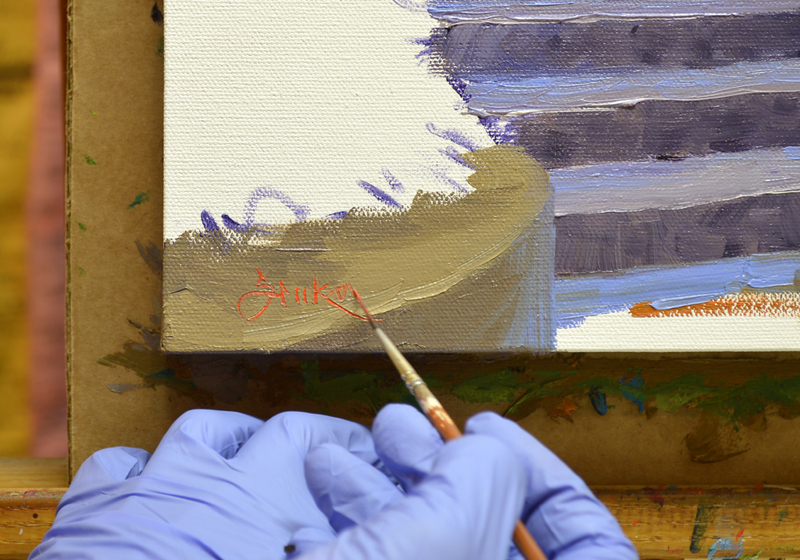 A mix of Ultramarine Blue + MUD + a touch of Cadmium Orange + White is used for the farthest edge of the rocks. The coolness and lightness makes it recede. We’ll begin with the sky. The mixtures are #1. White + Cobalt Blue. #2. White + Pthalo Blue. #3. White + Pthlao Blue + a little Lemon Yellow. 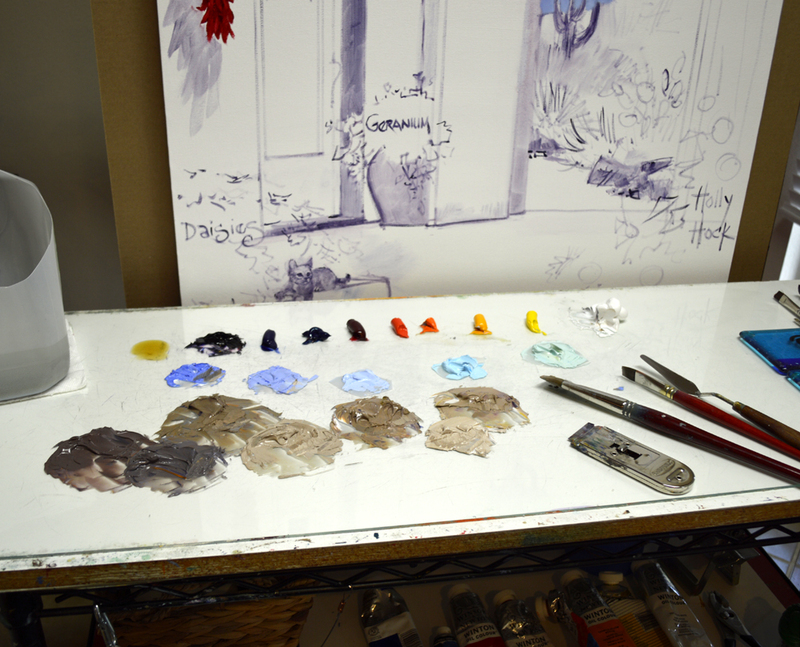 The basic colors of Jack’s Double Primary Mixing System that I use are lined up at the top of my palette. The colors are always placed in the same spots, like the letters on your keyboard. I can get the color paint I need with my eyes closed, just like typing without looking at your fingers. 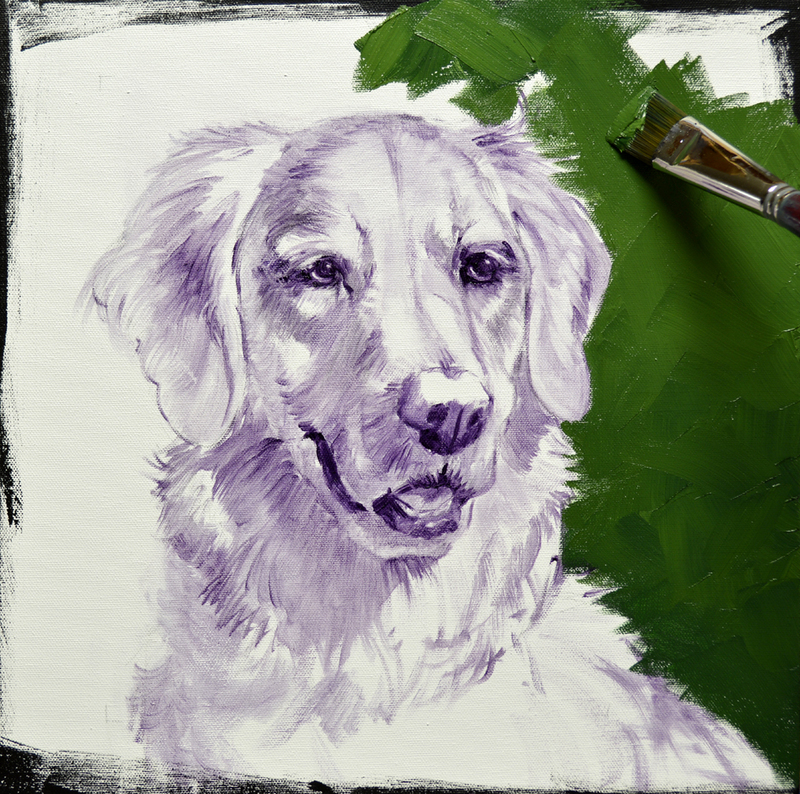 To learn more about Jack’s color mixing system CLICK HERE. 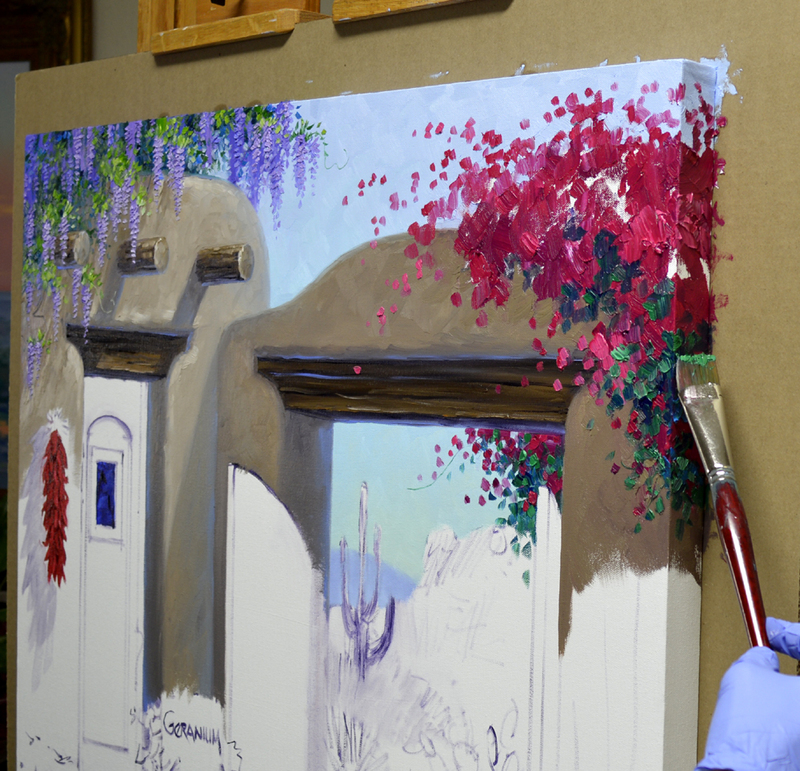 Even with the easel cranked down to its lowest position I still have to stand on a step stool to paint the top edge of the gallery wrap canvas. 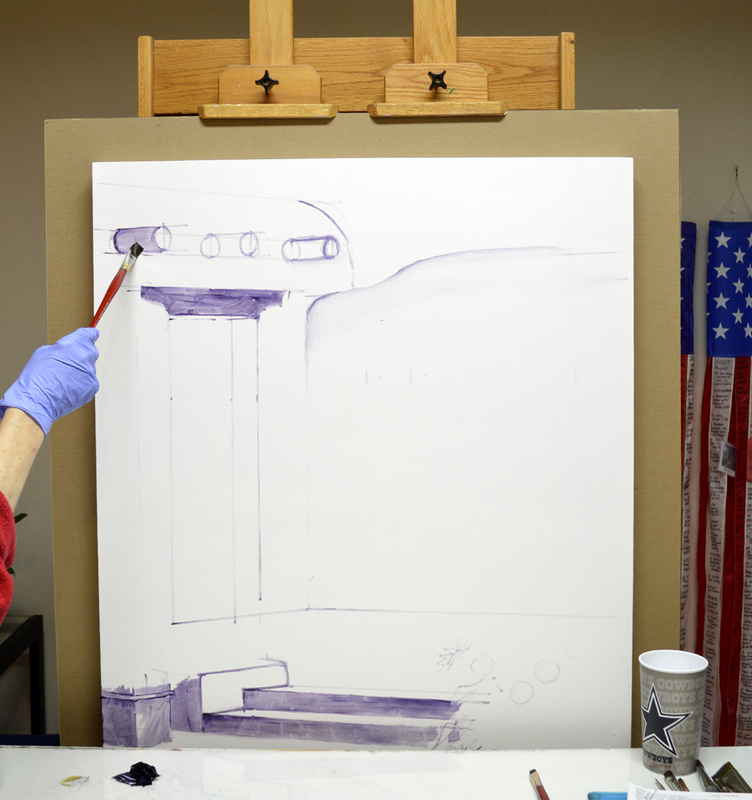 You can also see my painting setup, all of the studio furniture is on wheels. 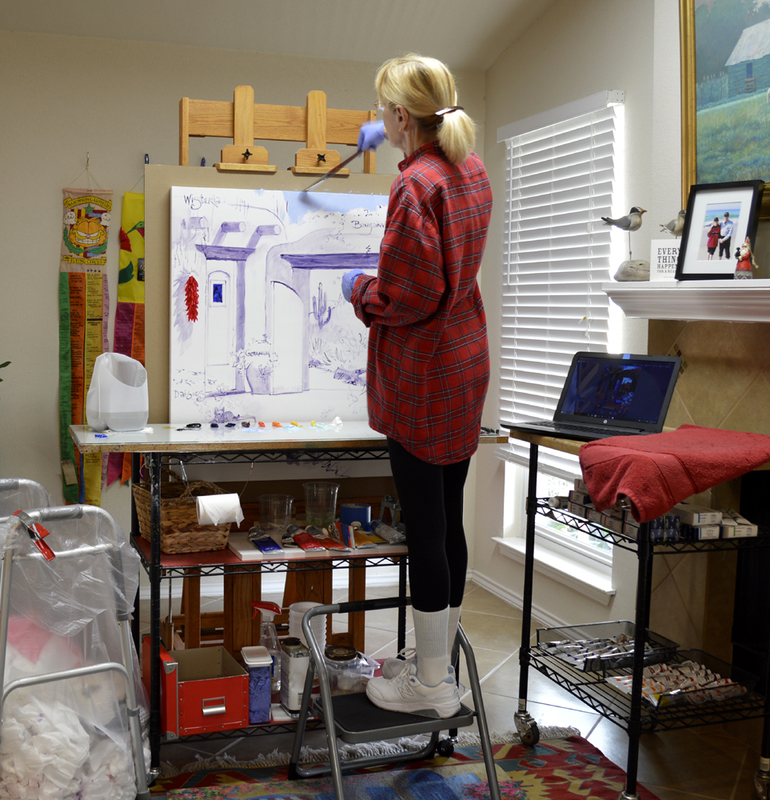 I can move the easel, palette and taboret to accomadate any size painting. If you’d like to enlarge the picture just click on the image. The sky closest to the top of the canvas is painted with mix #1. Moving down, mixture #2 is used. Mix #3 covers the portion of the sky nearest the mountains. 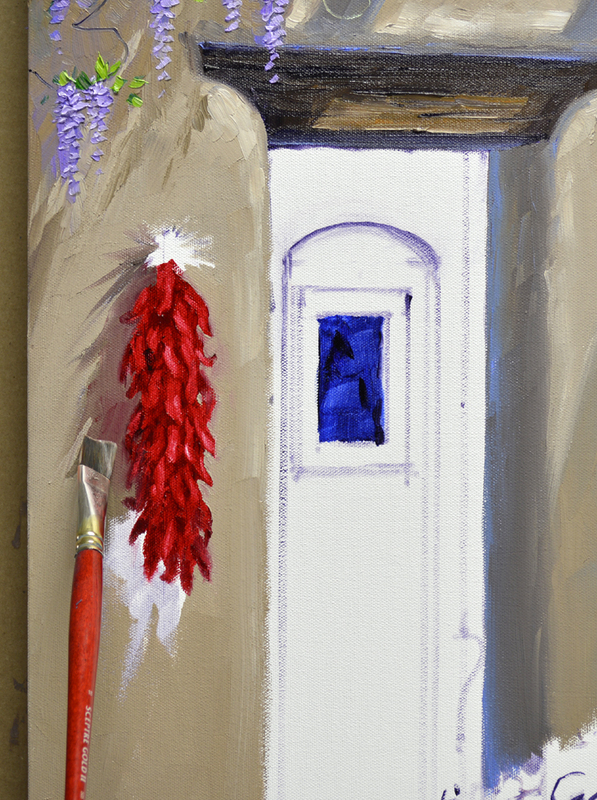 All of the adobe mixtures are made of various combinations of MUD (Ultramarine Blue + Alizarin Crimson) + Cadmium Orange + Ultramarine Blue + White. Isn’t it amazing how many variations you can get by mixing just 4 colors? 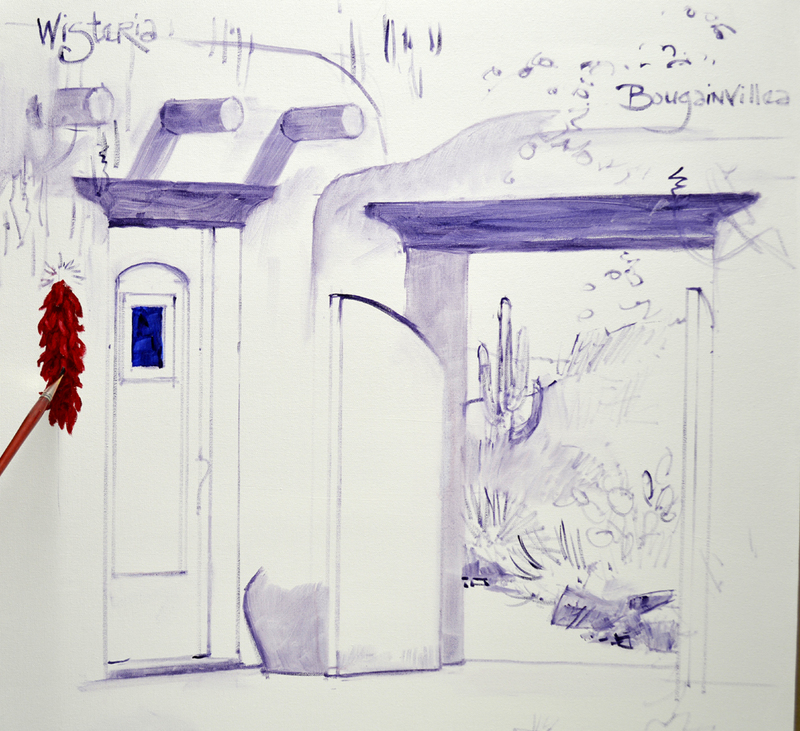 I begin by establishing the shadows of the Wisteria on the wall over the door. 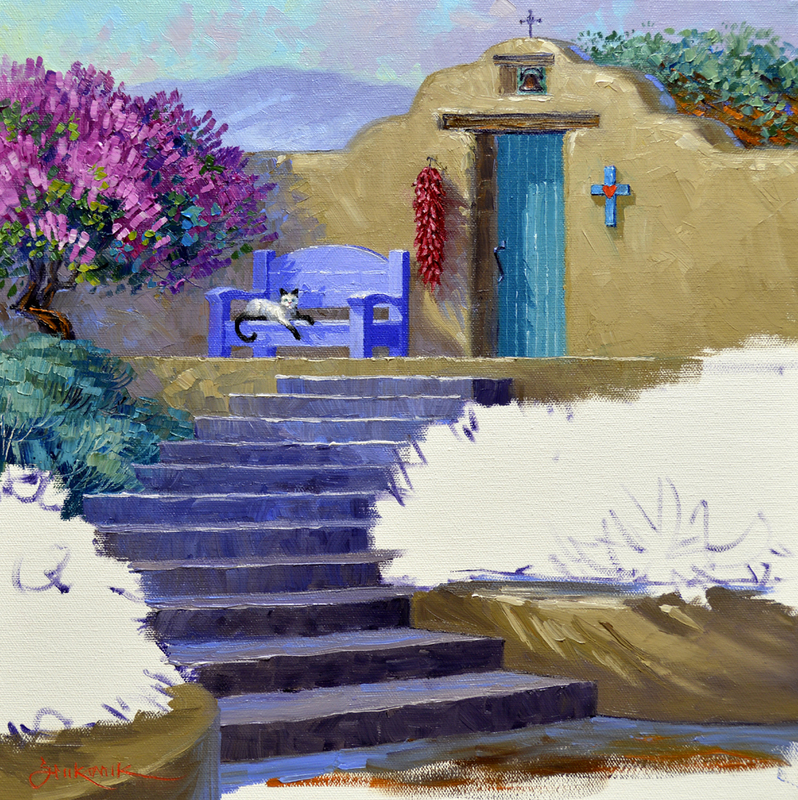 The sunlit part of the rounded adobe building that is toward the back is made bluer, or cooler. This is so it will recede. 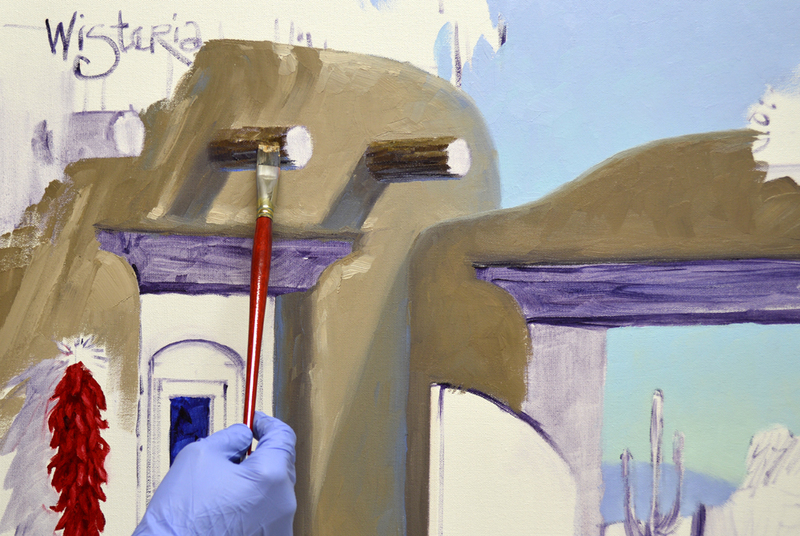 The wooden Vigas are painted with mixtures of MUD + Cadmium Orange and MUD + Cadmium Orange + White. 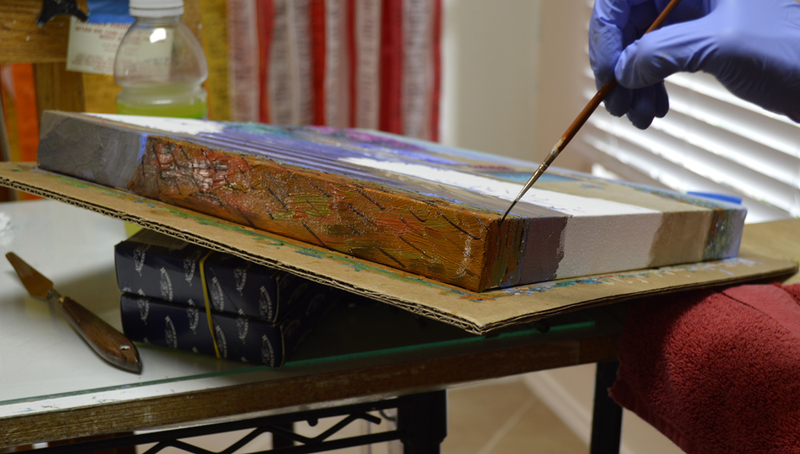 A stoke of Ultramarine Blue + White is pulled along the bottom edge of the Viga to help make the beam appear round. Wisteria is such a beautiful blooming vine. 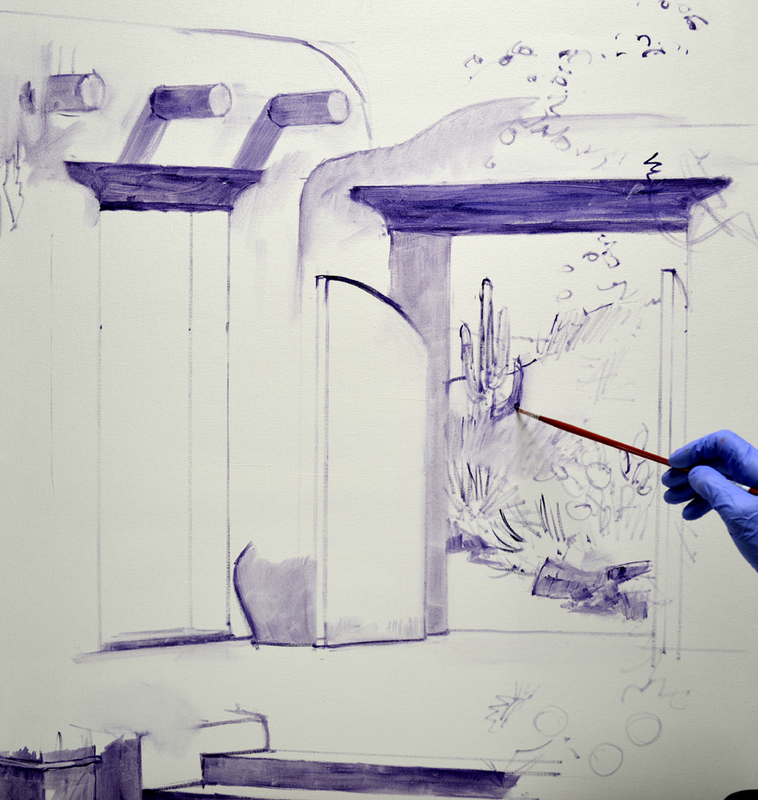 The wispy blossoms are blocked in with mixes of Dioxazine Purple + Ultramarine Blue + White and Dioxazine Purple + White. Then I come back and paint the leaves with combinations of Viridian Green + a tiny bit of Cadmium Yellow Medium + White. To The Sonoran Desert We Shall Go! 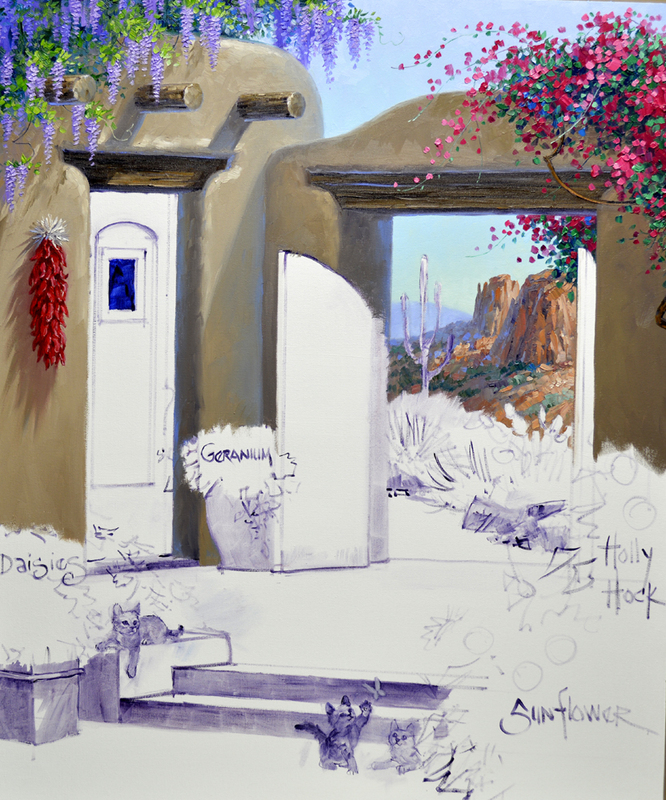 Another commission, we’re heading to the Sonoran Desert today. My collectors saw this piece on the blog and fell in love. They basically want the same painting with just a few changes. So….let’s get to work. 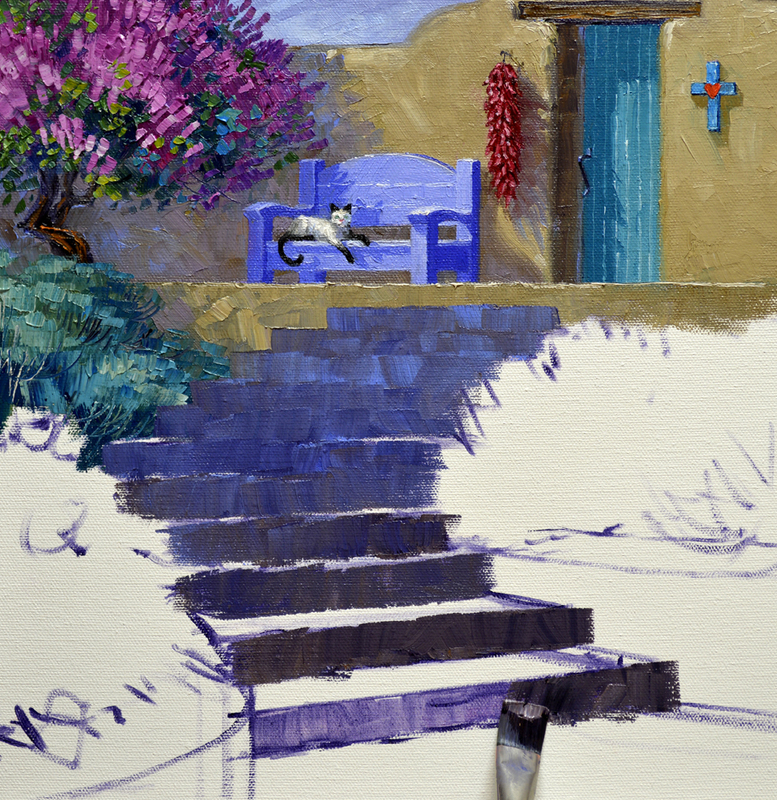 I begin by sketching the foreground terrace and steps with a brush dipped in a thin oil wash of MUD (Ultramarine Blue + Alizarin Crimson) + Liquin. 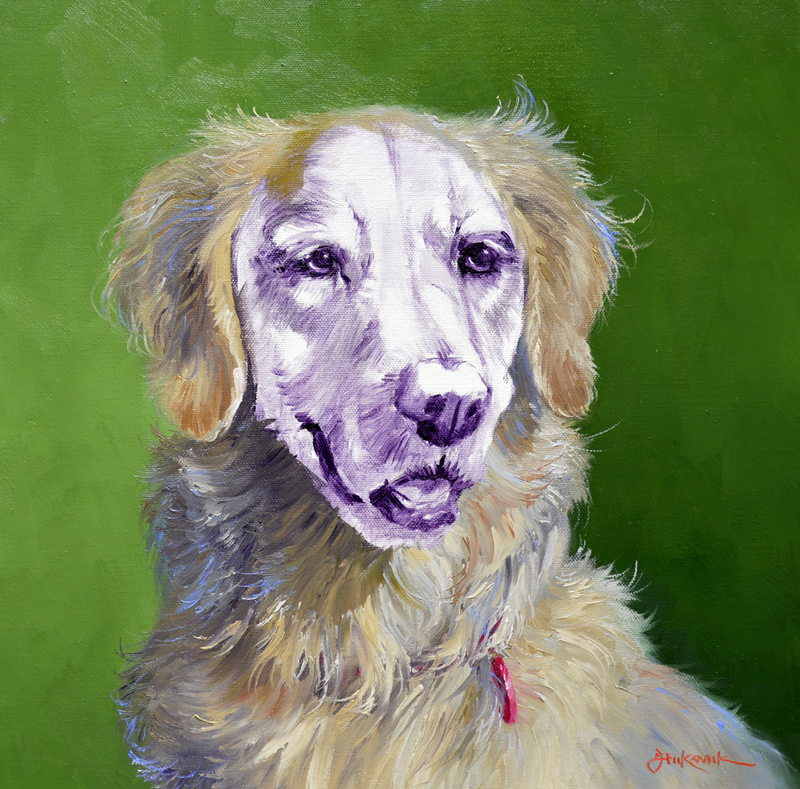 The piece is 36 inches tall by 30 inches wide on a gallery wrap canvas. Since the image will extend on to the edges of the canvas I’ve attached it to cardboard. This will make handling the wet painting a whole lot easier. Want to know how I did that? CLICK HERE to find out. 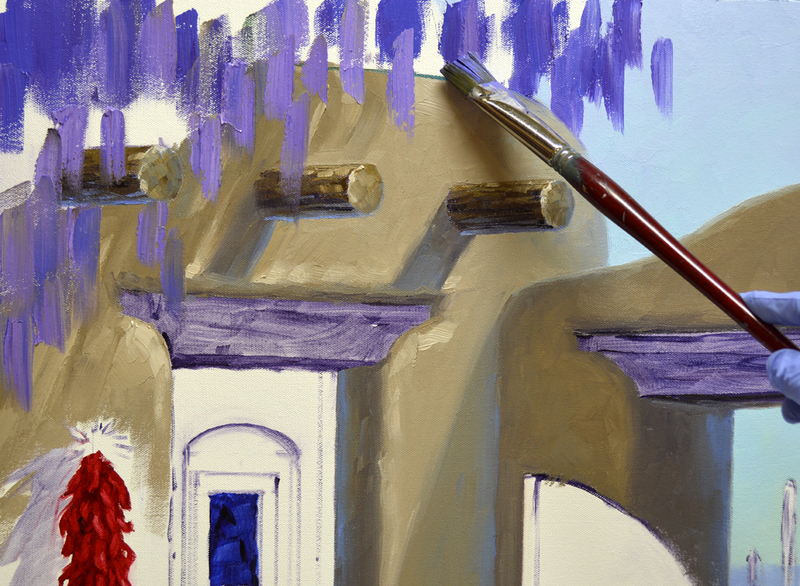 The adobe wall and building are constructed next. Vigas, a southwestern term for the beams supporting the roof, extend from the wall over the door. The heavy beams over the door and gate are called Lintels. 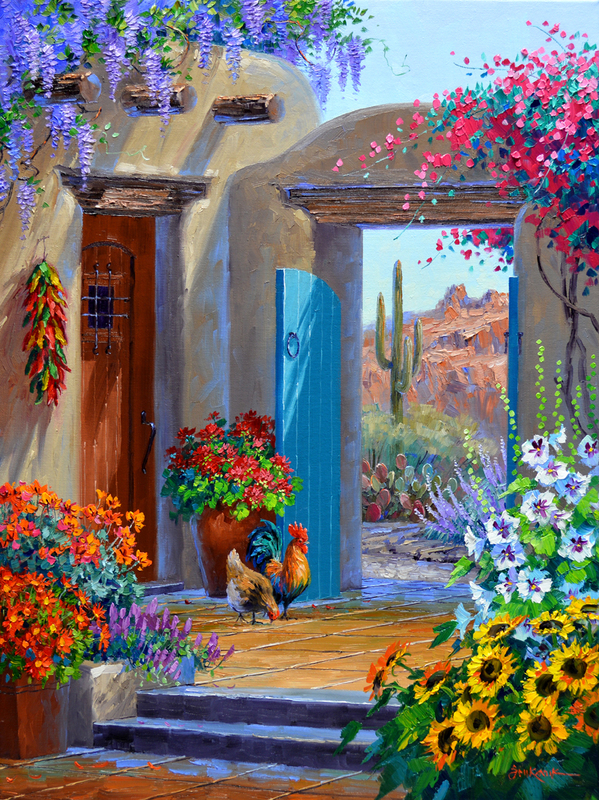 Jack and I lived in Carefree Arizona for a few years, right in the heart of the Sonoran Desert. 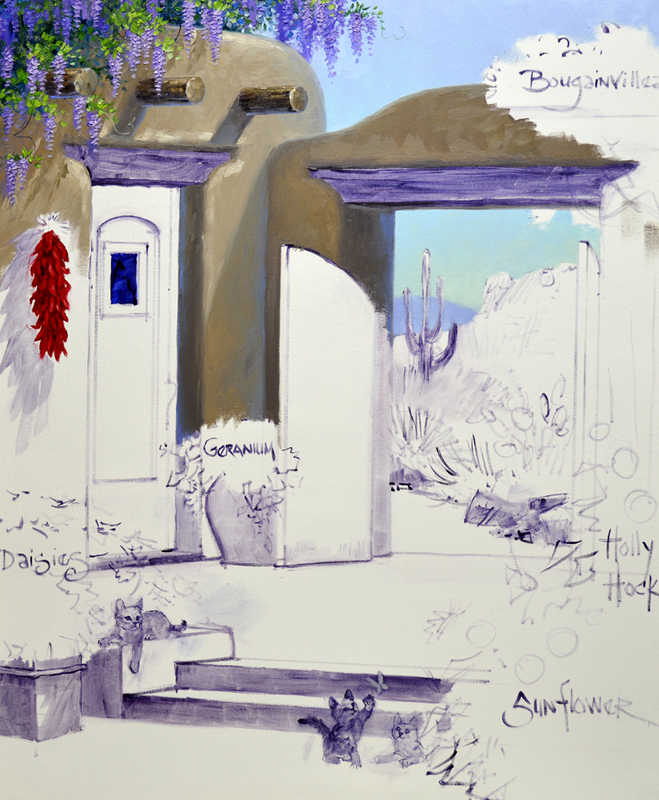 I LOVE the desert, we were fortunate enough to have nine tall Saguaro cacti on our property. 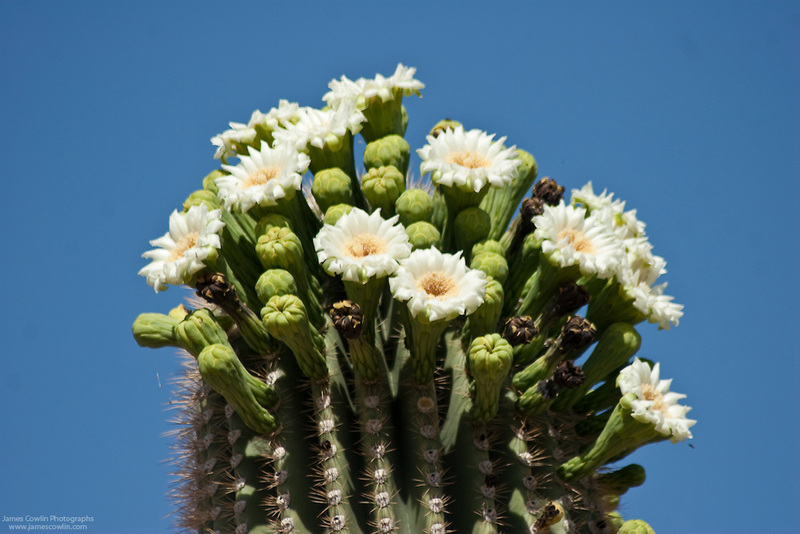 After spring rains the Saguaro Cacti sprout beautiful white flowers on top of their long arms. It makes them look like they are holding little bouquets. I found this picture on Google.com so you could see how pretty they are. One of the changes my client asked for was to make the ristra all Red Chile Peppers. 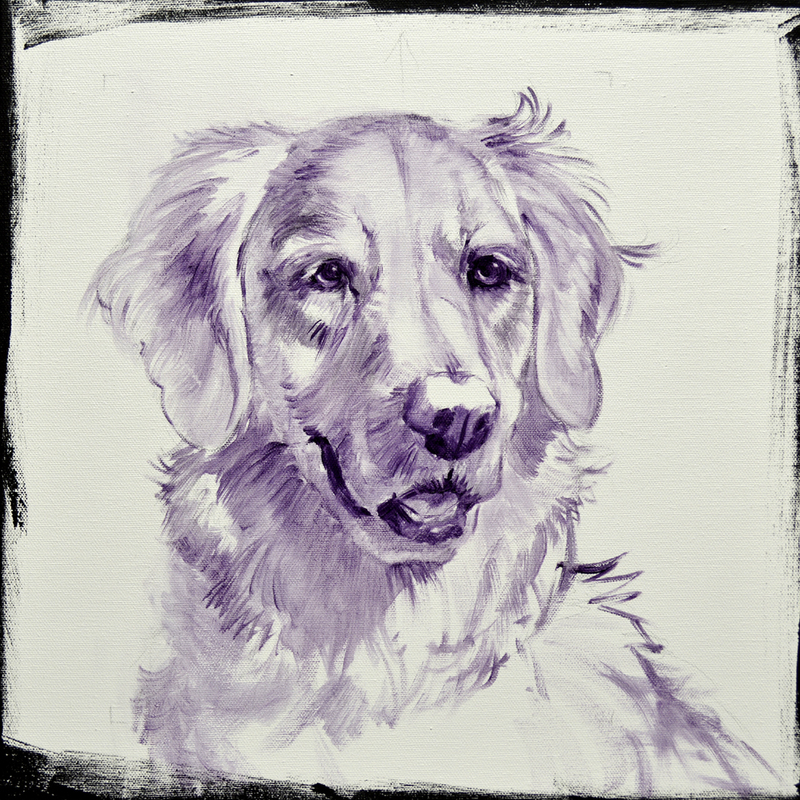 So it’s washed in with Alizarin Crimson + Liquin. I’ll come back later and paint them with opaque oils. Anne and Brian are cat people. 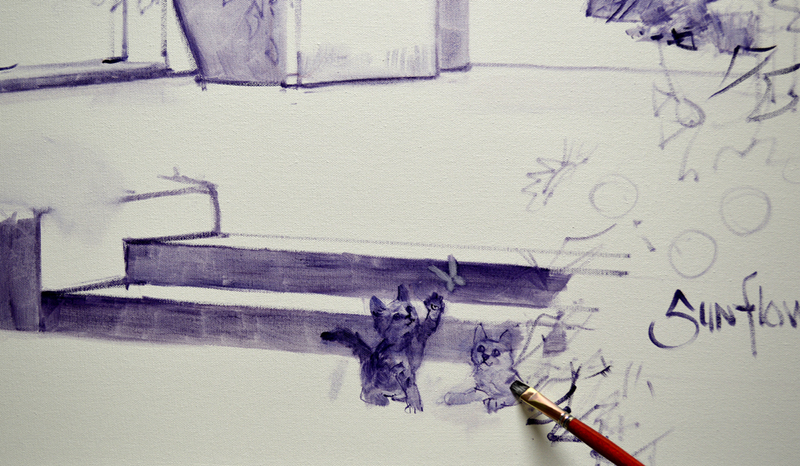 They asked me to take out the rooster and hen, replacing them with kittens somewhere in their painting. Thought it would be fun to have a couple trying to catch a butterfly at the base of the Sunflowers. Please remember as you read through my blog, you may click on any of the pictures to see them larger. 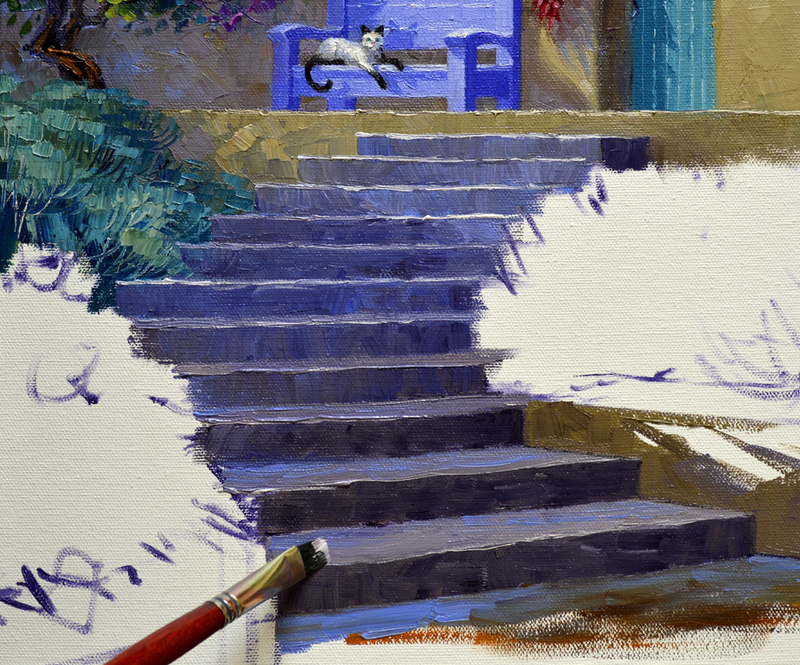 Another little kitty appeared on the left side of the steps; looks like he’s ready to bound over to help! 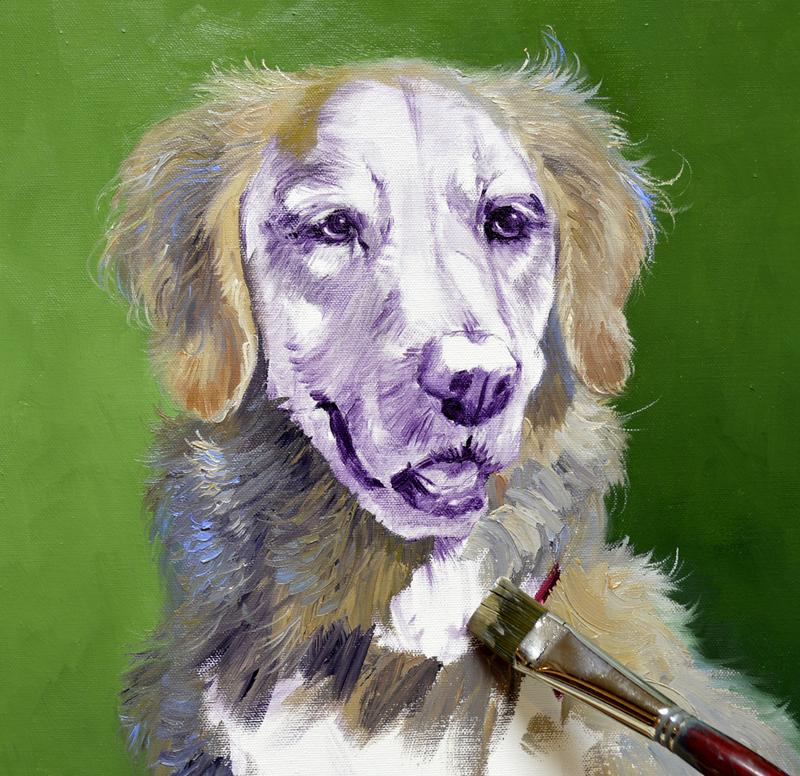 We’ll begin painting in the next session, hope you’ll come back and watch. If you would like to receive an email every time I publish a new post please feel free to subscribe to my blog. CLICK THIS LINK and scroll to the upper right side of the page. You will see a heading EMAIL SUBSCRIPTIONS. Just enter your email address and click the button “Sign me up!” It’s easy. And if you enjoy my blog please CLICK the FaceBook LIKE Button. As we say in Texas, “Much Obliged! I can’t begin to tell you how much I appreciate all of you. Your love and support this year has been overwhelming. I Thank You from the depth of my soul. 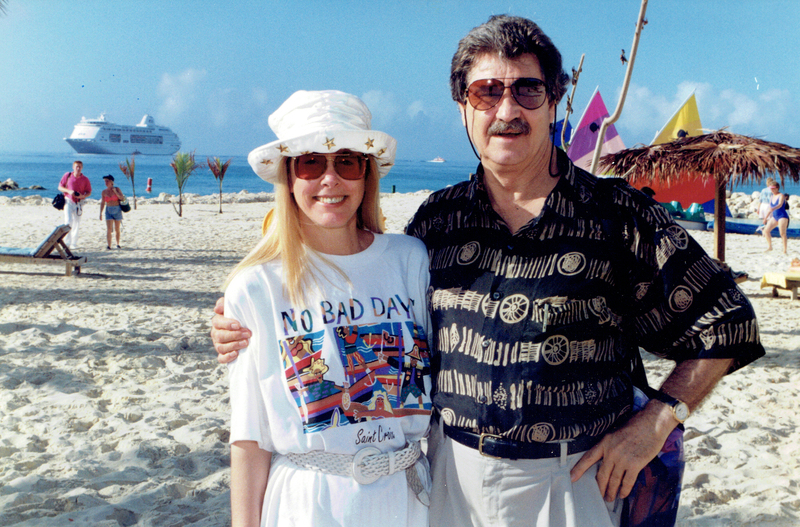 I’m sure Jack is in Heaven smiling down on all of you for helping me along my new path. You’ve made this difficult transition much easier. It’s wonderful knowing Jack is in Heaven because God so graciously gave up His only Son to die for our sins; that one day I’ll be with my soul mate again. 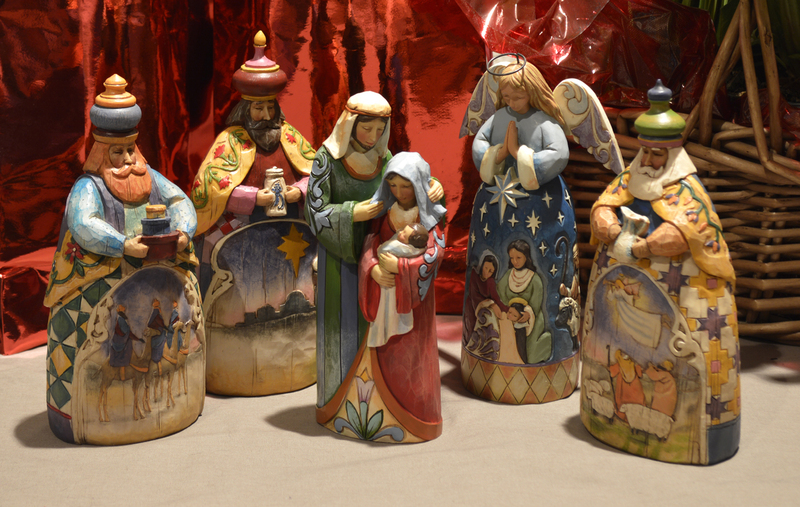 We can celebrate CHRISTmas because of Our Father’s generous sacrifice and blessing. I pray your Christmas is filled with Love, Laughter and the Spirit of the Christ child. The shadow side of Emma’s face is also made cooler, or bluer. Shadows are established before painting the sunlit portions of her head. 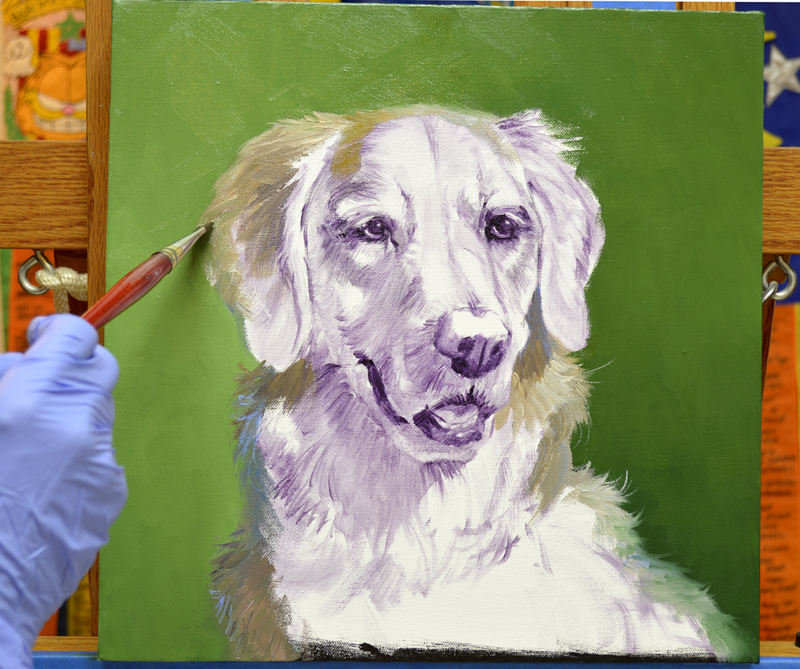 A large Bright (square) brush is used to block the areas in, then I’ll come back with a smaller brush and indicate some individual hairs. Ivory black is used for Emma’s lips. I guess that’s what you call the edges of a dog’s mouth! 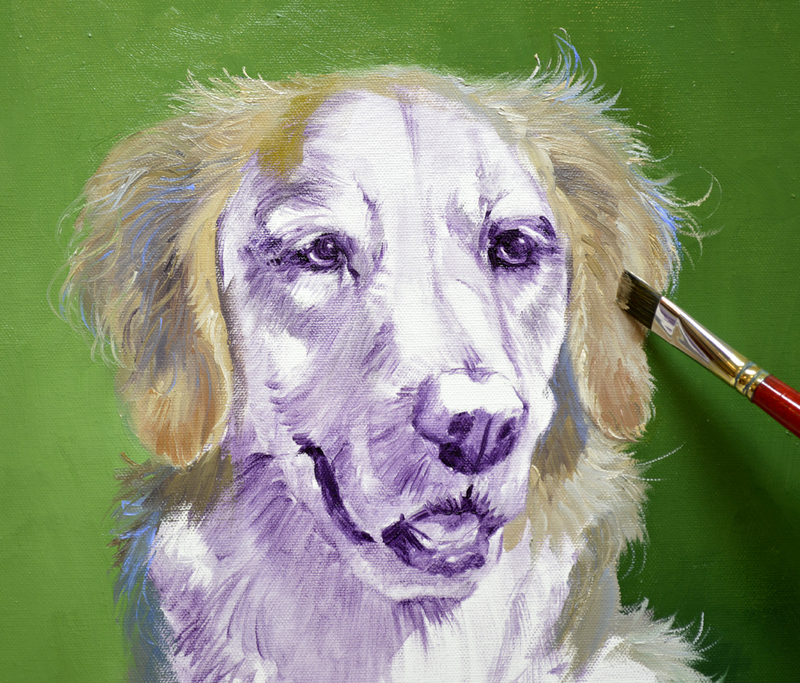 The solid black is painted first, then I’ll drag the hair on her muzzle over it. Mixtures of Ivory Black + Alizarin Crimson + White make her nose. Whiskers are so fun to do. 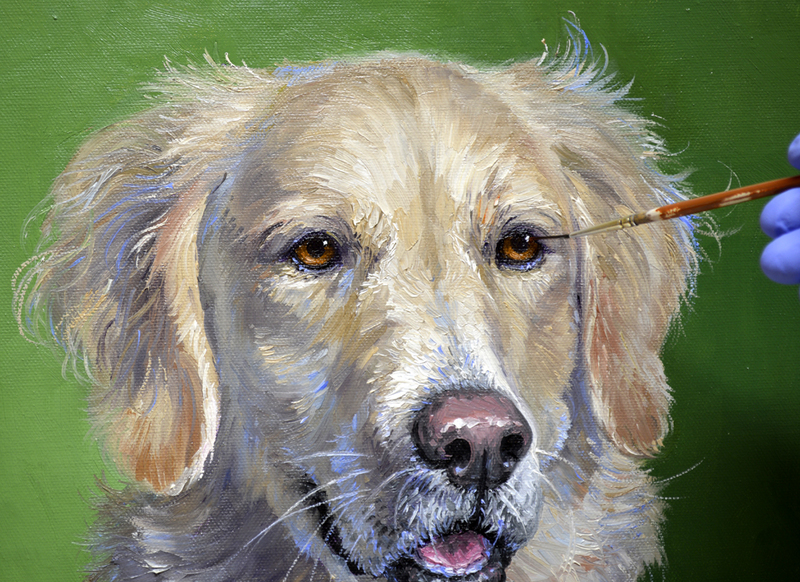 A fine liner brush is used to pull them into the wet paint of her muzzle and lower jaw. 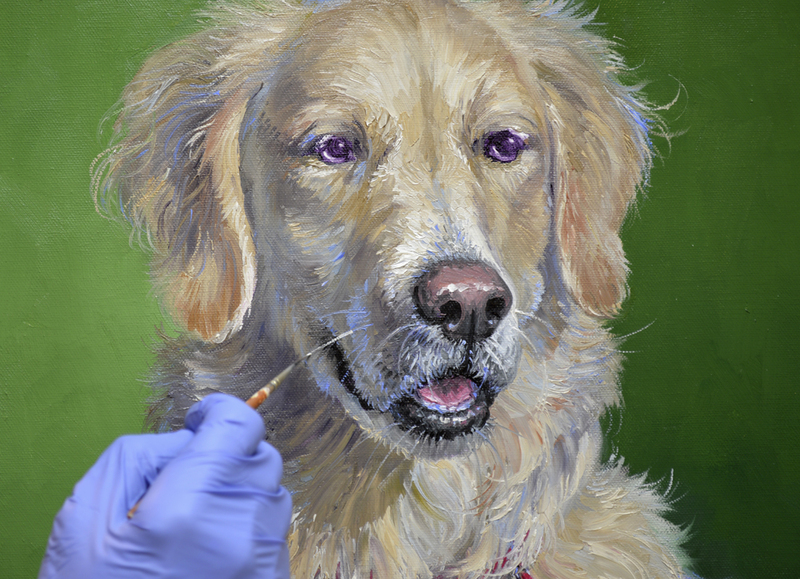 Mixes of Alizarin Crimson + a touch of MUD (Ultramarine Blue + Alizarin Crimson) + White are perfect for Emma’s tongue. 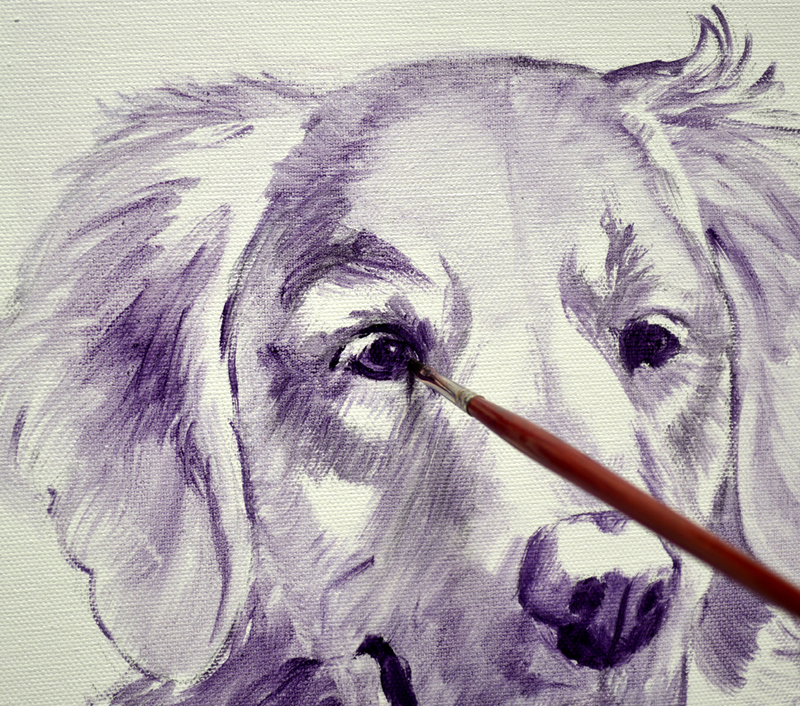 Jack always said, “The eyes are the soul of a portrait.” He taught me his simple method for painting eyes. The entire area of the eye is blocked in with MUD. Then the iris is painted with a dark shade of brown made of MUD + Cadmium Orange. To see this better just enlarge the picture by clicking on the image. Since light streams into the portrait from the upper right the iris is highlighted on the lower left at about 7 o’clock. White is added to the brown mixture for the lighter shade. Using my fine liner brush a tiny White catch light is placed at 1 o’clock. Blonde eyelashes accentuate Emma’s beautiful brown eyes and we’re done! 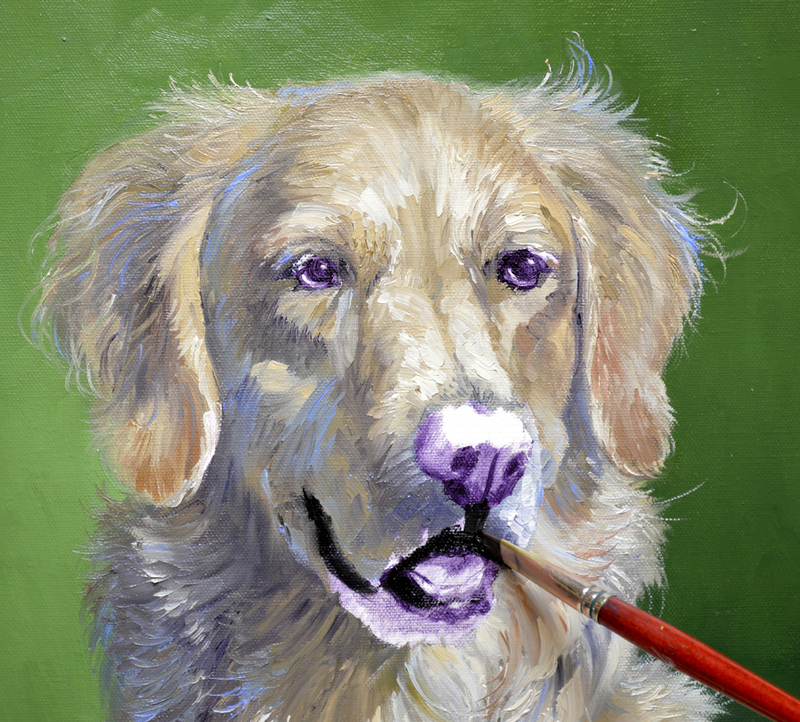 I wonder what Emma is going to think when she sees this portrait of herself. I sure hope she approves! Hugs to all and Best Wishes for a very Merry Christmas! 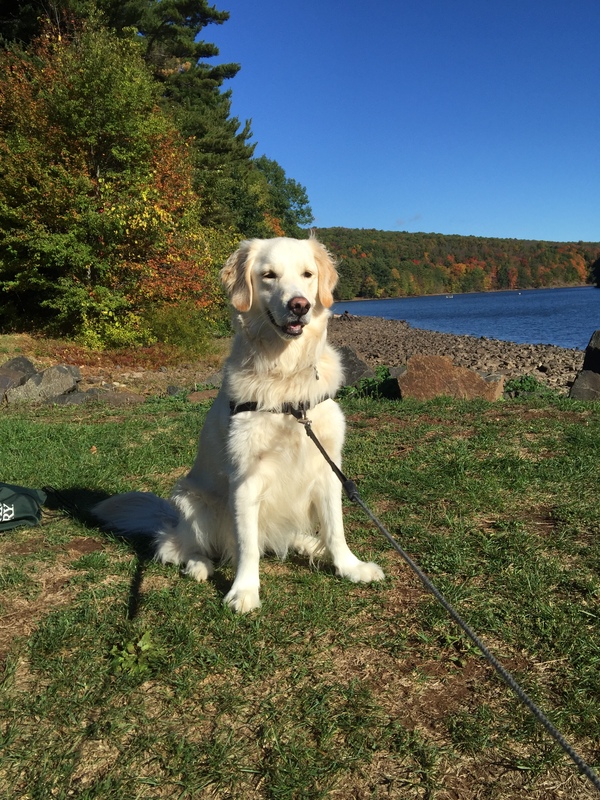 I played with a few mixtures before coming up with ones that work best for Emma’s silky coat. 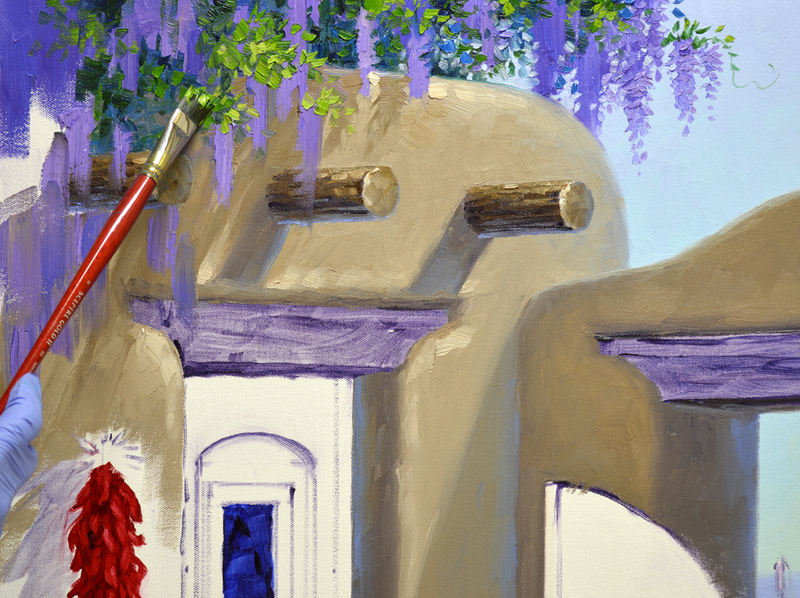 What’s funny is, they are almost the same as the basic adobe mixtures in my southwest paintings. I’ve made several combinations in different proportions of MUD (Ultramarine Blue + Alizarin Crimson) + Cadmium Orange + Ultramarine Blue + White. 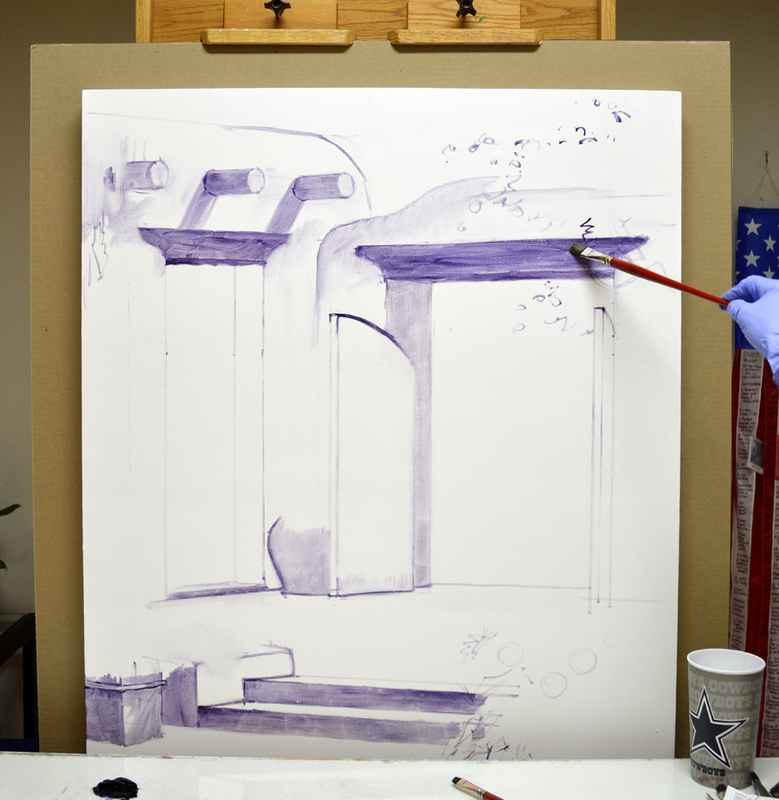 On the shadow side of her neck and shoulder a mix of Ultramarine Blue + White is added along the edge. This helps to give the feel of roundness to her body. The background is still wet, so it’s easier to pull those stray hairs catching the light into it with a fine liner brush. I don’t want to paint each and every individual hair, just add a few here and there. 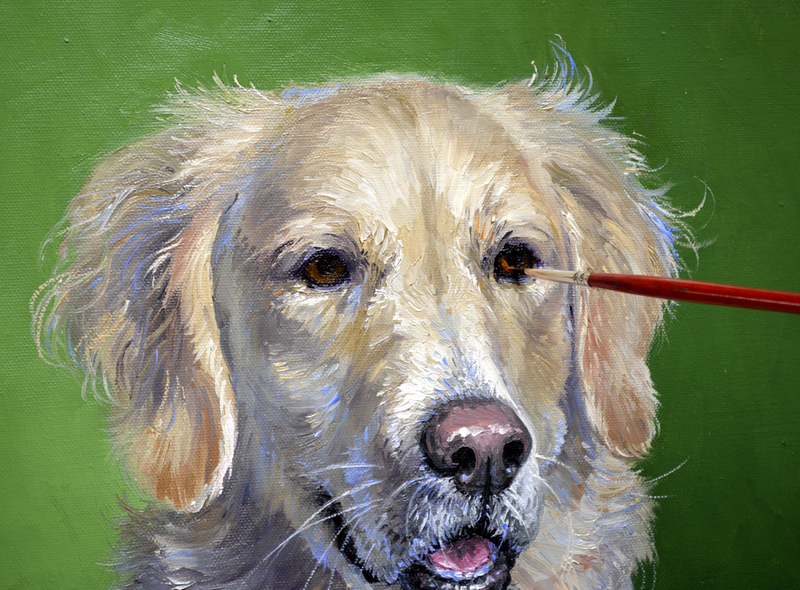 Next time you look at a dog you’ll realize you see their coat as a mass of color, not lots of tiny hairs. 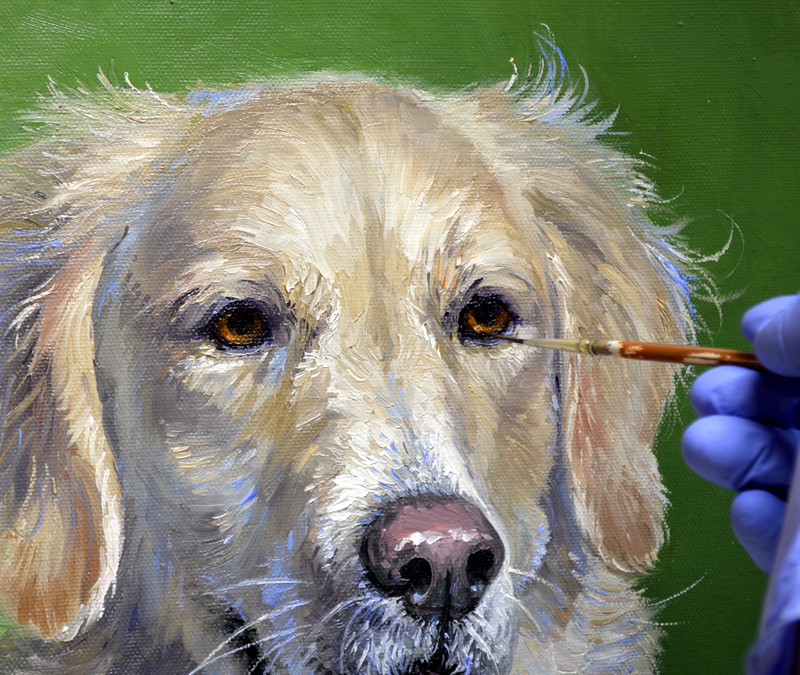 Her ears are painted wet-into-wet which helps to keep the feeling of their softness. I make Emma’s neck and lower body cooler and a little darker. 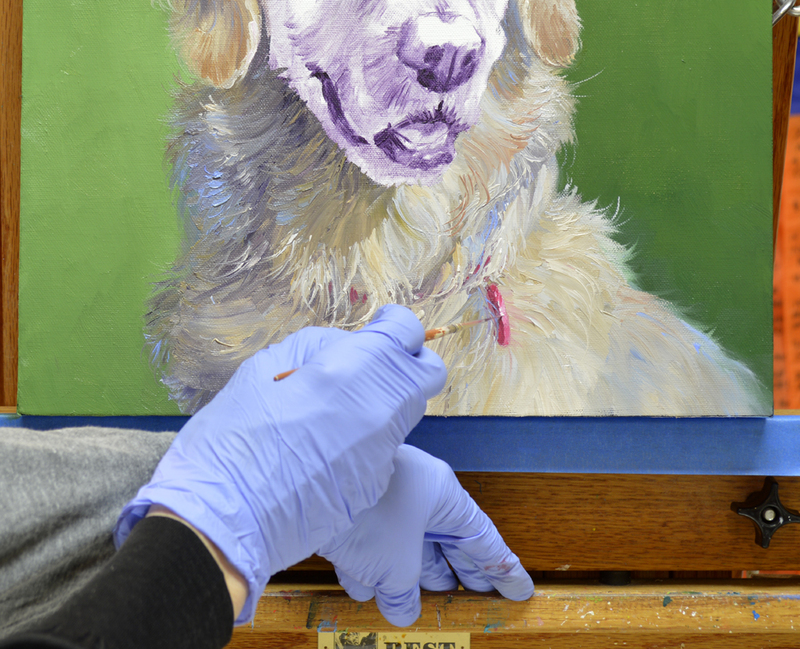 I’m saving the warmest and lightest colors for her face, the focal point of the painting. The dog tag is pink, just perfect for the pretty little girl. 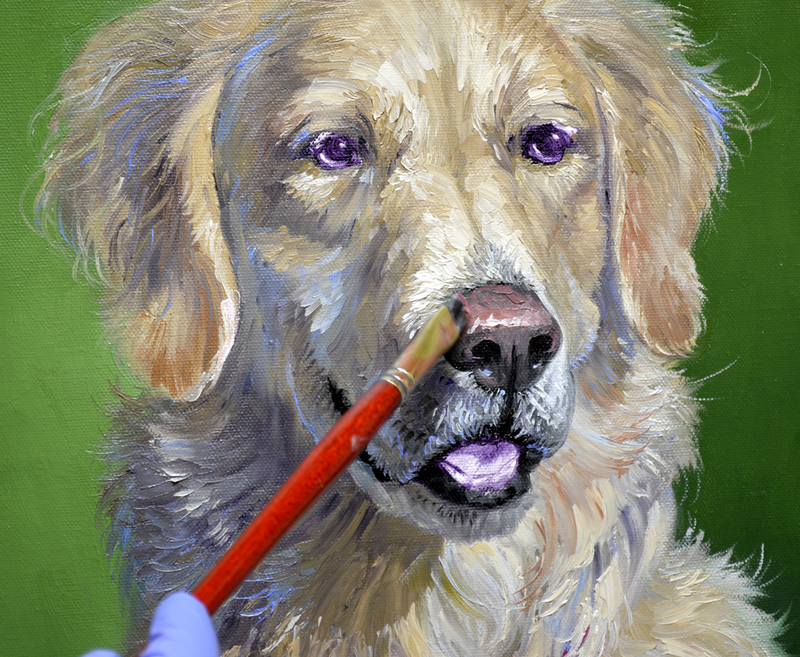 Today we’re starting on a portrait of a sweet Golden Retriever named Emma. Isn’t she beautiful? 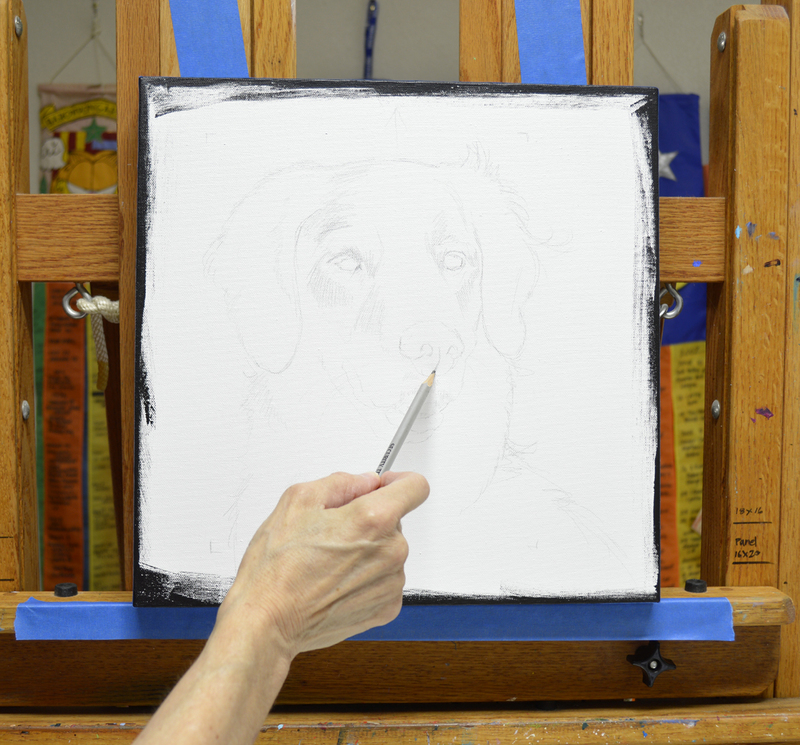 My first step is to lightly draw the darling baby up on the canvas with pencil. Please remember as you read through my blog, you may click on any of the pictures to see them larger. 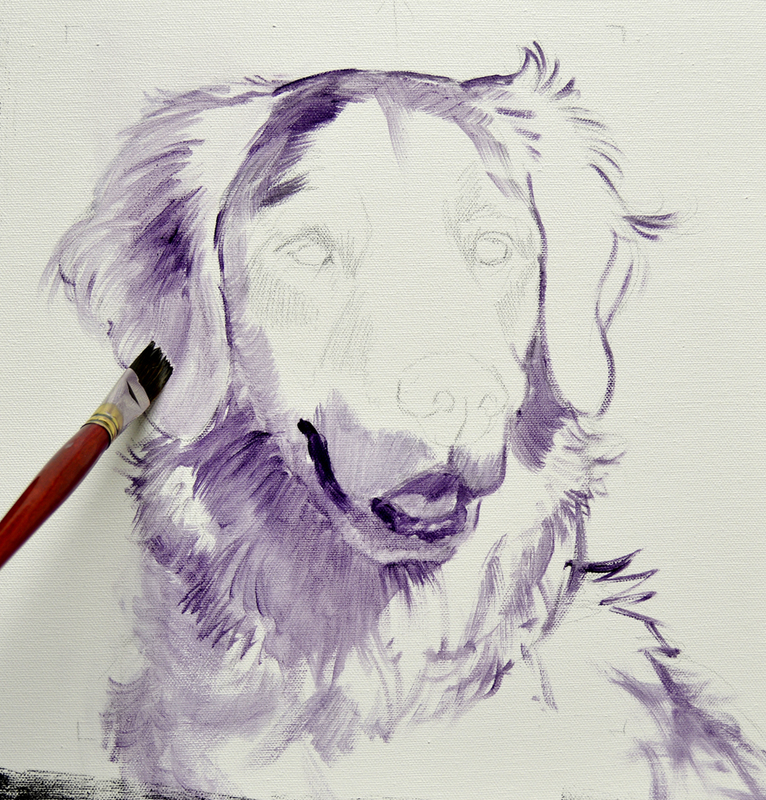 Using a brush dipped in a thin oil wash of MUD (Ultramarine Blue + Alizarin Crimson) + Liquin I begin sketching in Emma’s silky coat. After establishing the basic values on her face I wash in Emma’s bright eyes. She’s all sketched up and patiently waiting for our next step, the background. I like the way Emma looked with the green trees behind her. So here are my color mixtures: #1. Sap Green + a touch of Pthalo Blue + Ivory Black + a bit of White. #2. Sap Green + a little Pthalo Blue + White. #3. Mix #2 + additional White. #4. Extra White is added to mixture #3. #5. Mix #4 + even more White. The sun is coming into the portrait from the upper right. I make the background on that side darker so the light areas on Emma will really be dramatic. 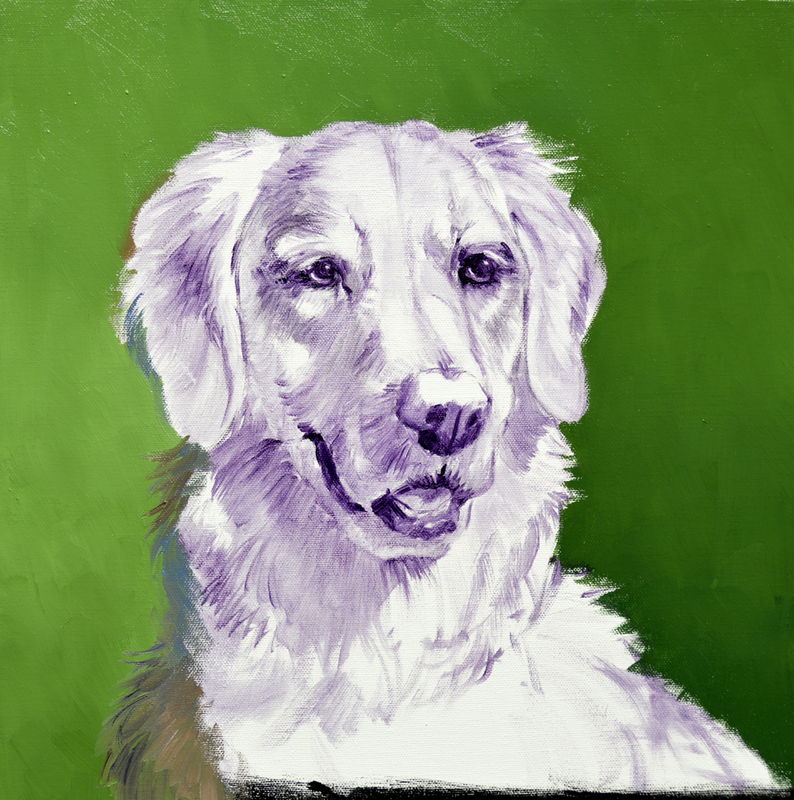 After completing the background I’ve done a little work on the left side of her body to experiment with color mixes for her soft fur. I’ll tell you what they are in our next session. See you then! If you would like to receive an email every time I publish a new post please feel free to subscribe to my blog. CLICK THIS LINK and scroll to the upper right side of the page. You will see a heading EMAIL SUBSCRIPTIONS. Just enter your email address and click the button “Sign me up!” It’s easy. And if you enjoy my blog please CLICK the FaceBook LIKE Button. As we say in Texas, “Much Obliged! 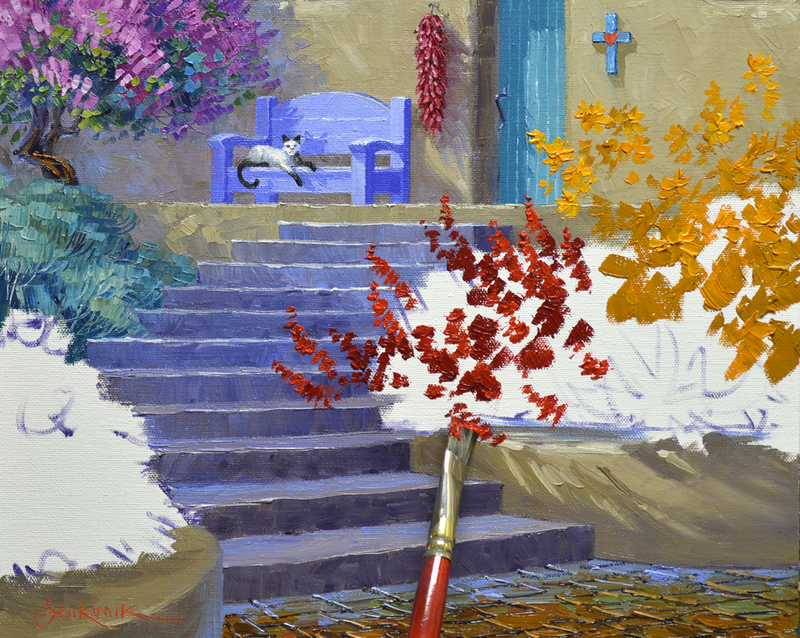 The entire surface of the uneven paver patio in the foreground is covered with heavy textured brushstrokes. I use mixes of MUD (Ultramarine Blue + Alizarin Crimson) + Cadmium Orange + White and MUD + Cadmium Orange + Cadmium Red Light + White. 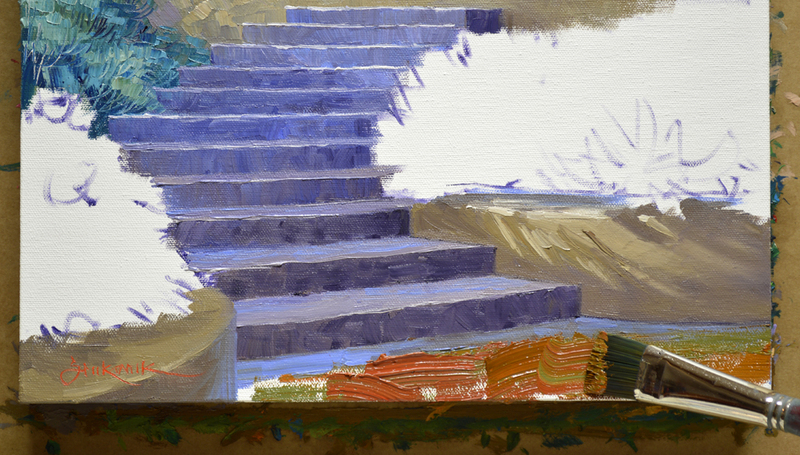 A few strokes of Ultramarine Blue + White are made along the floor at the base of the steps to make it recede. By the way, these same mixtures were used for the tile roof of the chapel. Perspective lines indicating the paver edges are drawn into the wet paint with a fine liner brush dipped in a mix of MUD + Liquin. 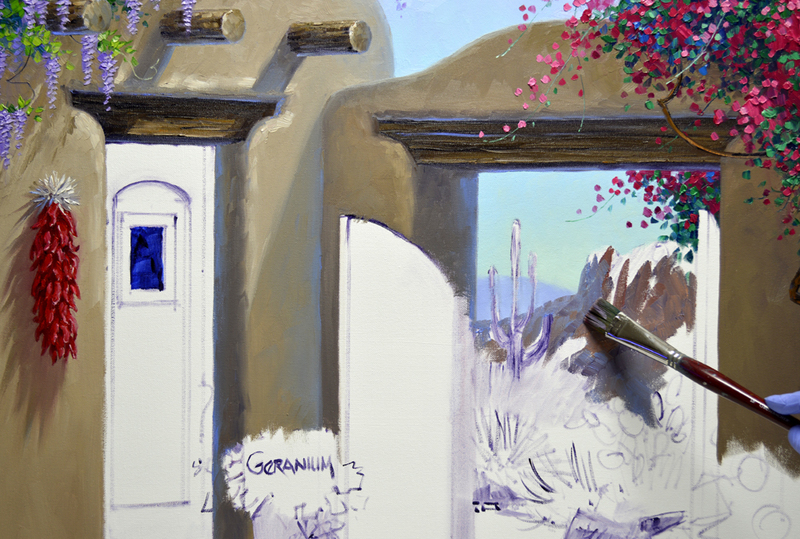 In order to paint the bottom I take the canvas, attached to the cardboard, off the easel and lay it flat. Actually the lower end is raised a little on a couple of paint boxes, making it easier to paint. 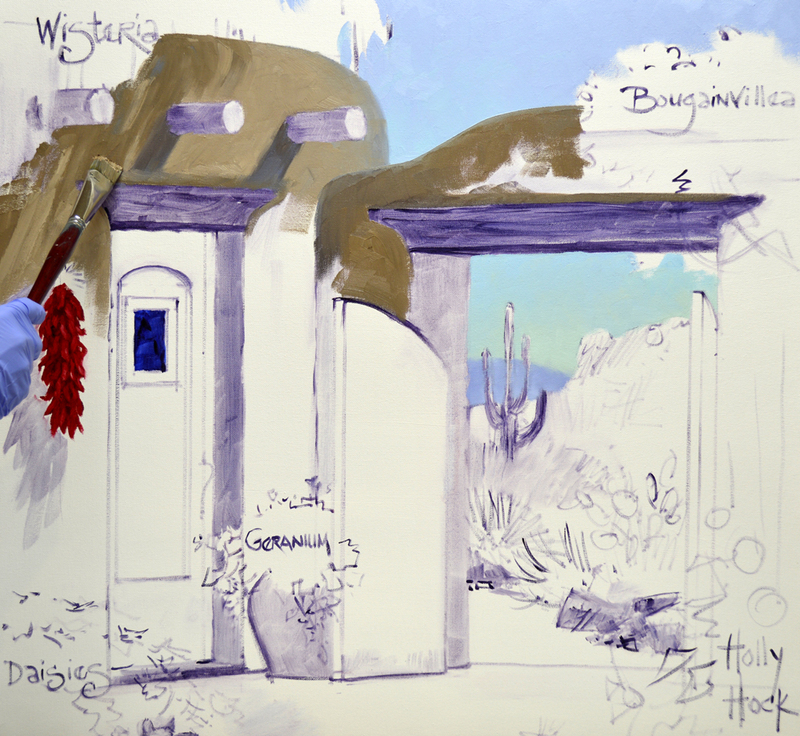 The perspective lines continue over, on to the sides of the gallery wrap canvas. The tiles are highlighted on the edges where the light catches them. OK….let’s get to planting. The blossoms of the Salvia and Maxmillian Sunflowers are blocked in first. 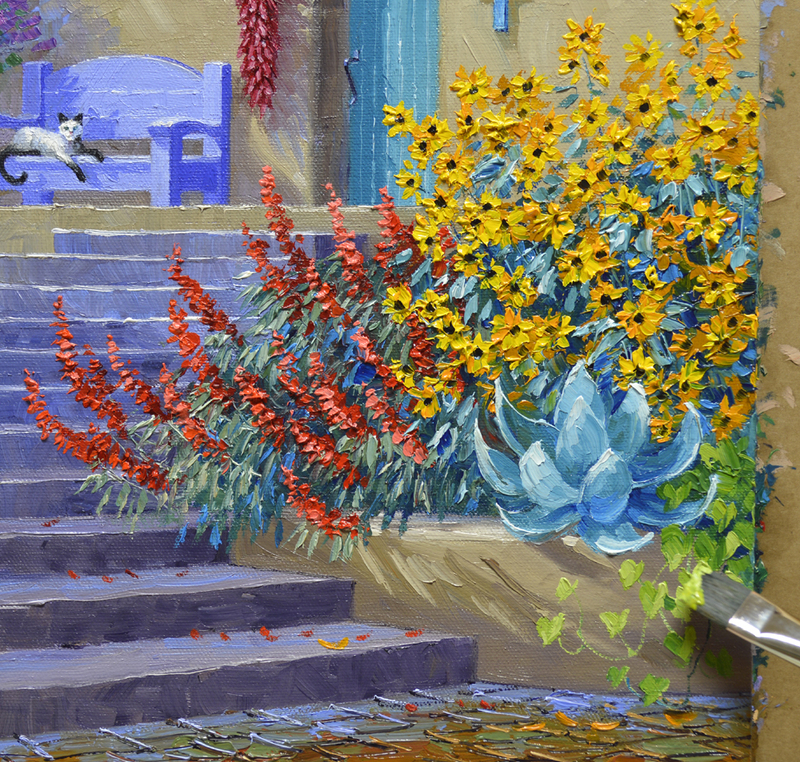 The soft grey, green leaves of the Salvia are made with mixes of Pthalo Blue + Cadmium Orange + White. 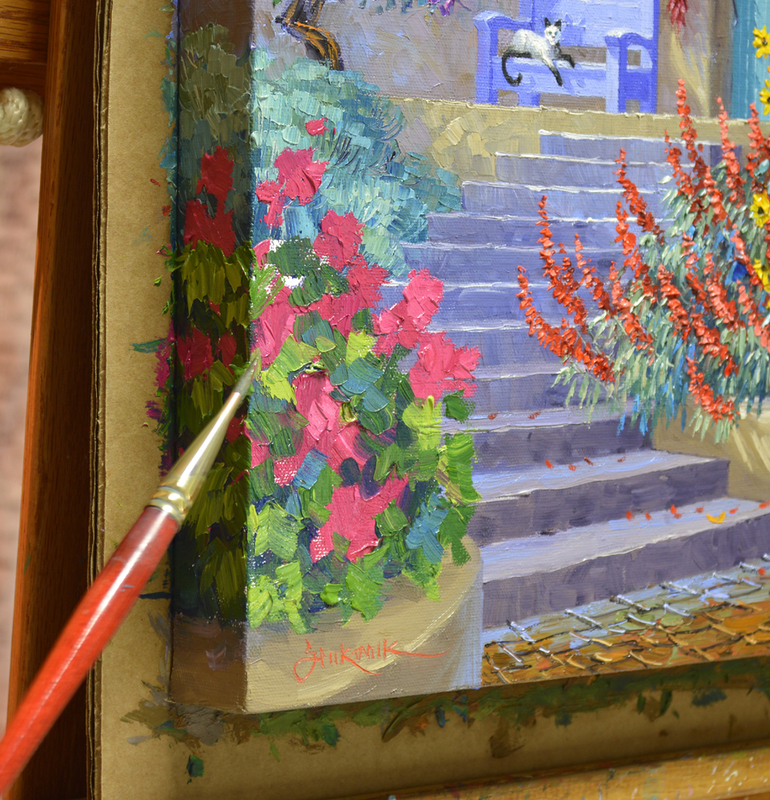 Then I come back and accent the individual flowers with Cadmium Red Light + a tiny bit of White. 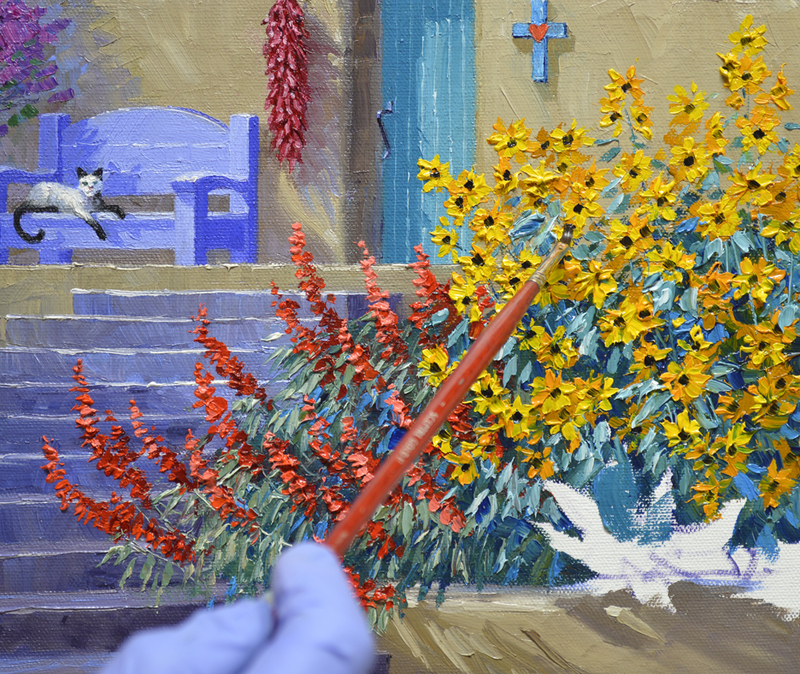 I add a little more Pthalo Blue to the paint leftover from the foliage of the Salvia to use for the Maxmillian Sunflowers. After delineating the sunny petals, the dark centers of the flowers are added. 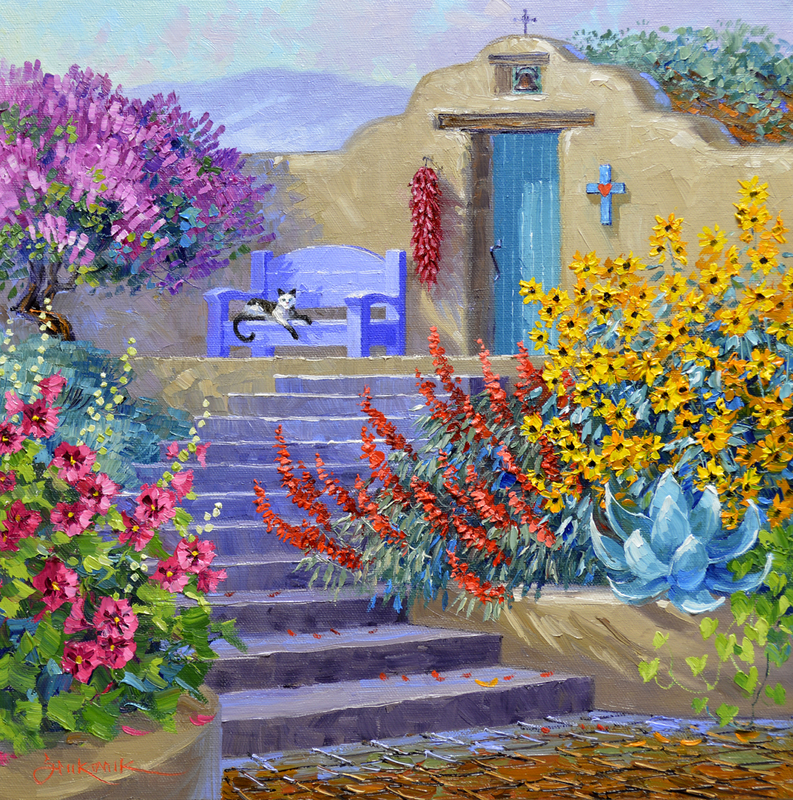 An Agave nestles at the base of the Sunflowers; heart shaped leaves of a Sweet Potato Vine spill over the wall beside the striking succulent. Pink Hollyhocks reside on the opposite side of the stairs. The rosy flowers are blocked in with several combinations of Permanent Rose + White. The Hollies grow over the edge of the canvas. The leaves are brighter greens of Pthalo Blue + Lemon Yellow. 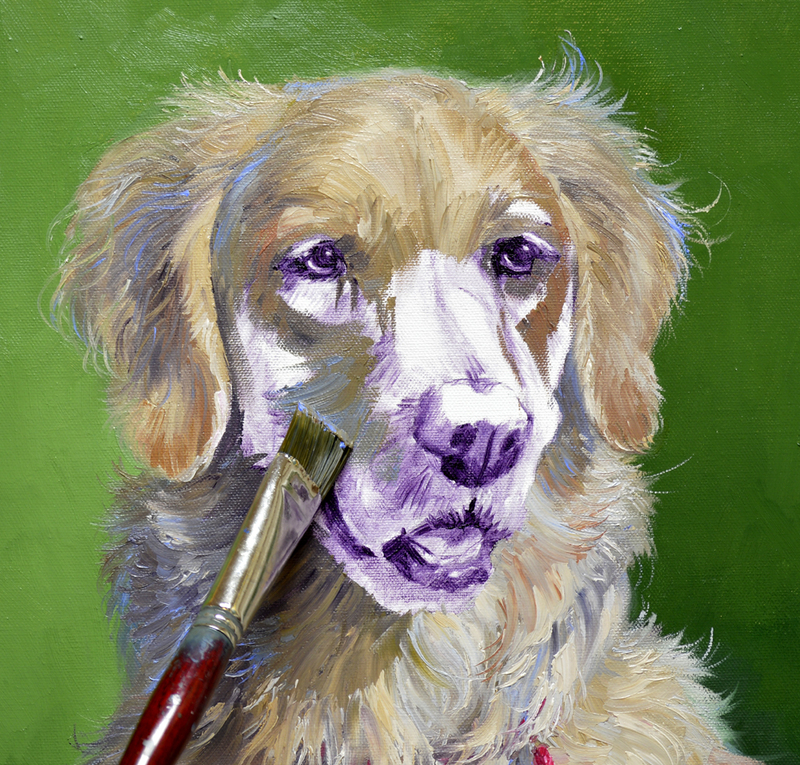 The chili ristra was initially washed in with a thin mix of Alizarin Crimson + Liquin. 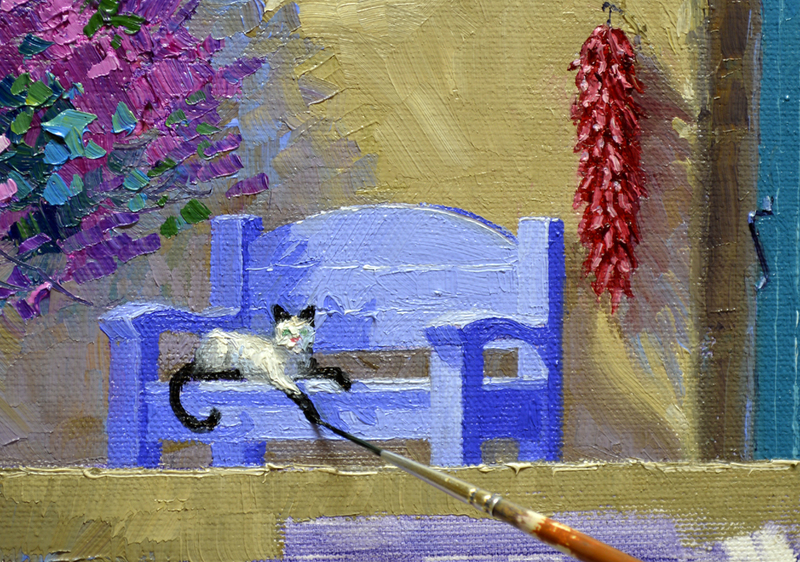 Now I come back, with opaque oils, to paint the peppers. 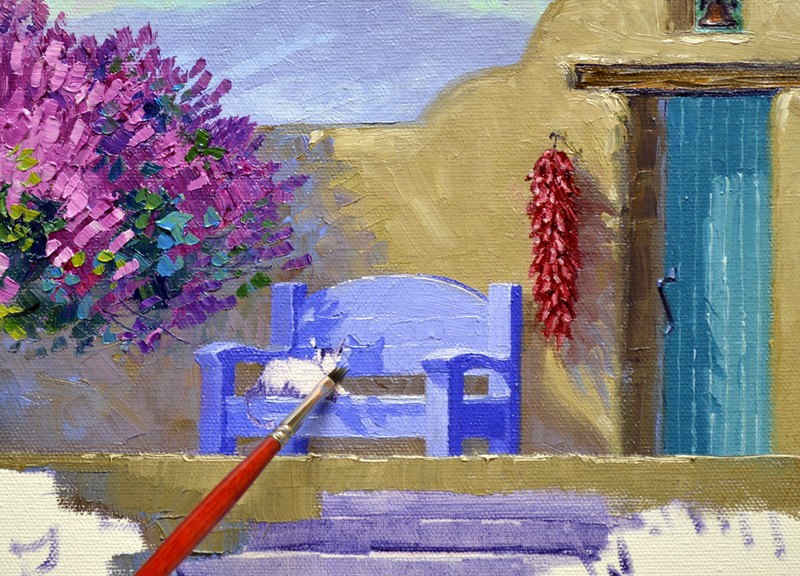 The corner of a medium Bright (square) brush is used to sculpt the individual chilis with lots of thick texture. If you’ll enlarge the picture by clicking on the image you can see this better. The little kitty casts a shadow on the back of the bench. Looks like “Bat Cat” is here! Our pretty baby lounges comfortably, basking in the warm sunshine. 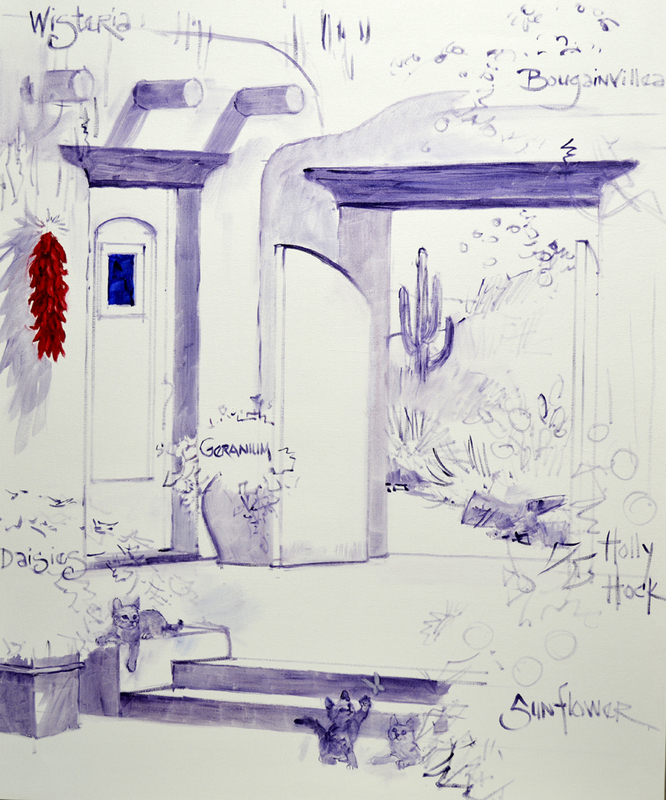 A fine liner brush is used to add the details. As the steps go back, ascending the hill, the risers are made bluer or cooler. 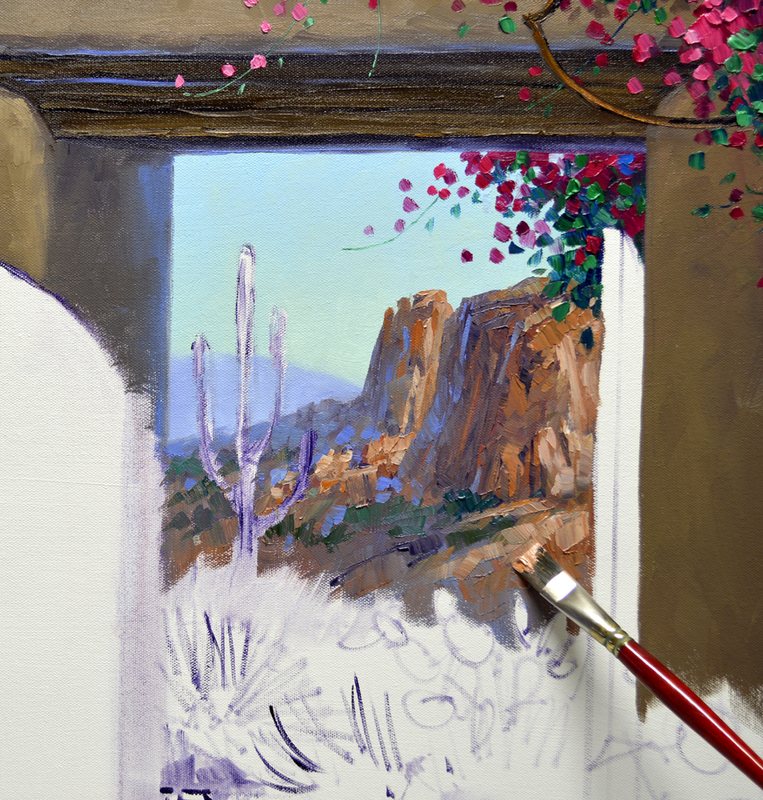 Those closer to the foreground are warmer following the simple rule: Warm Colors Come Forward, Cool Colors Go Back. Next the tops of the steps are made. 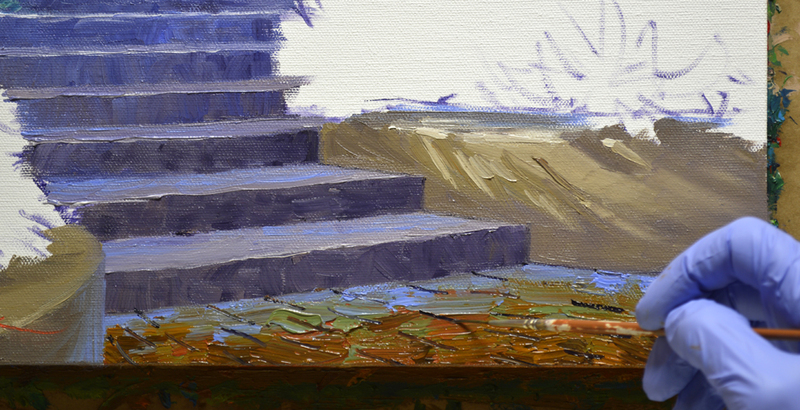 When painting steps the flat surface is lighter because the light from above illuminates the top directly. Less light hits the upright riser or side of the step; therefore it’s darker. 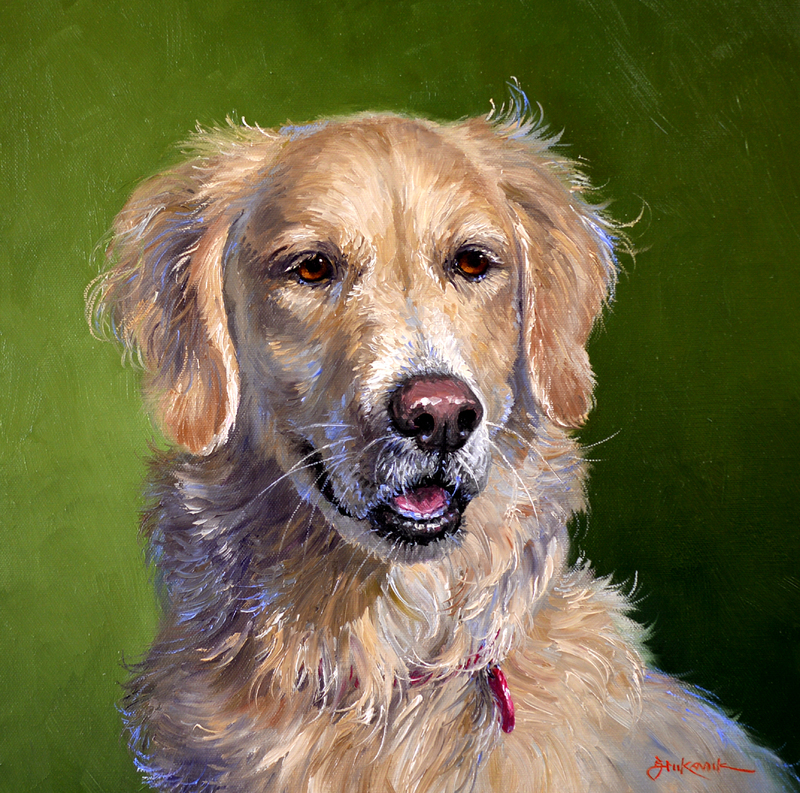 Several of my readers have asked, “When do you sign your paintings?” I always do my Cadmium Red Light Signature when the area it’s going to be placed is painted, even though the piece may not be finished. Working wet-into-wet allows me to easily make the lines of the calligraphy smooth. 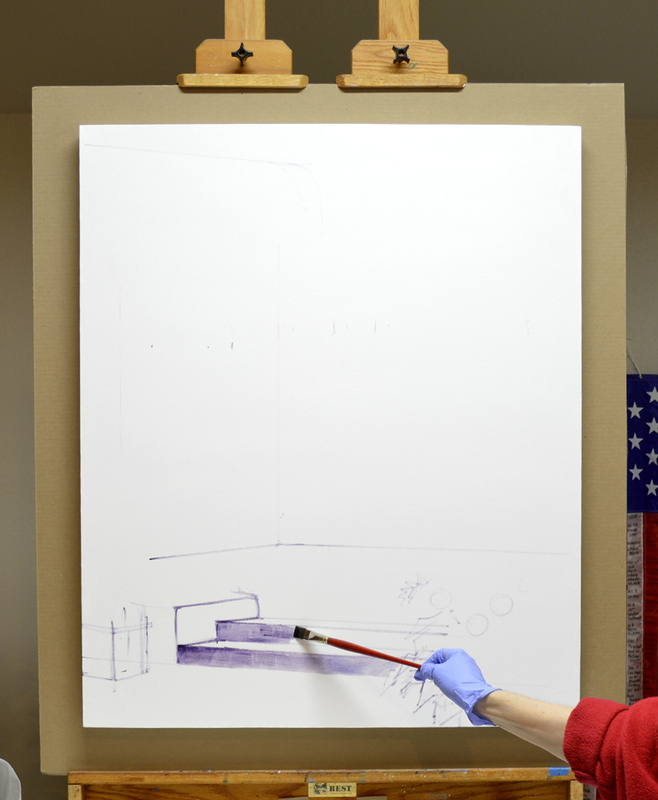 I brace my left hand on the easel, resting my right on it to give a steady support as I sign with a fine liner brush.